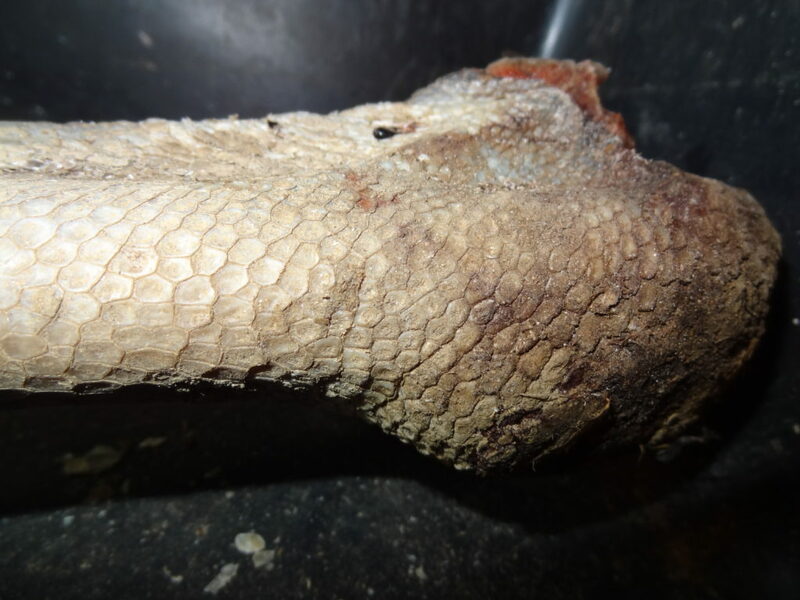 I was recently able to acquire two fresh partial ostrich legs from a breeder. This was a perfect chance to study the external and internal anatomy of this giant bird’s legs and feet. I could take a really close look at things that I could neither see in a living ostrich in a zoo nor in a mounted taxidermy specimen. 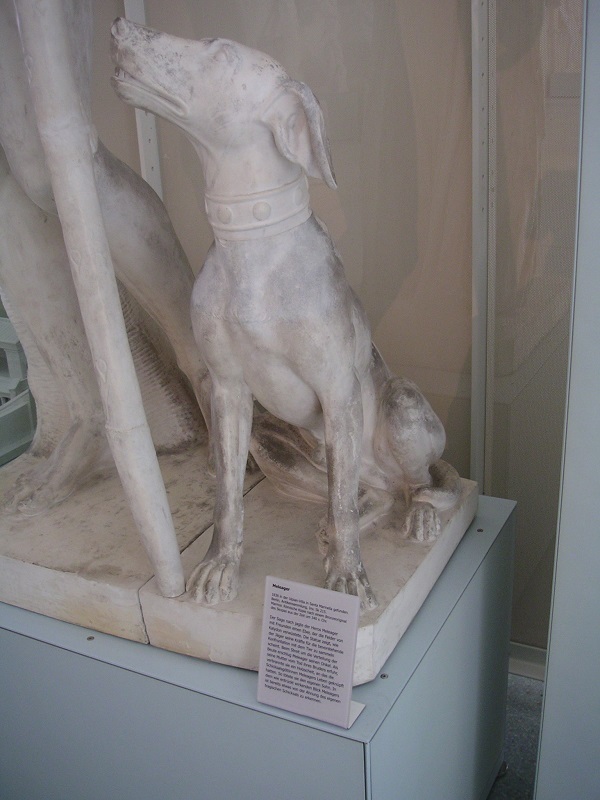 For me this was particularly interesting because I gould get firsthand data about anatomical details for sculptures and illustrations for which it’s very hard to find good references. 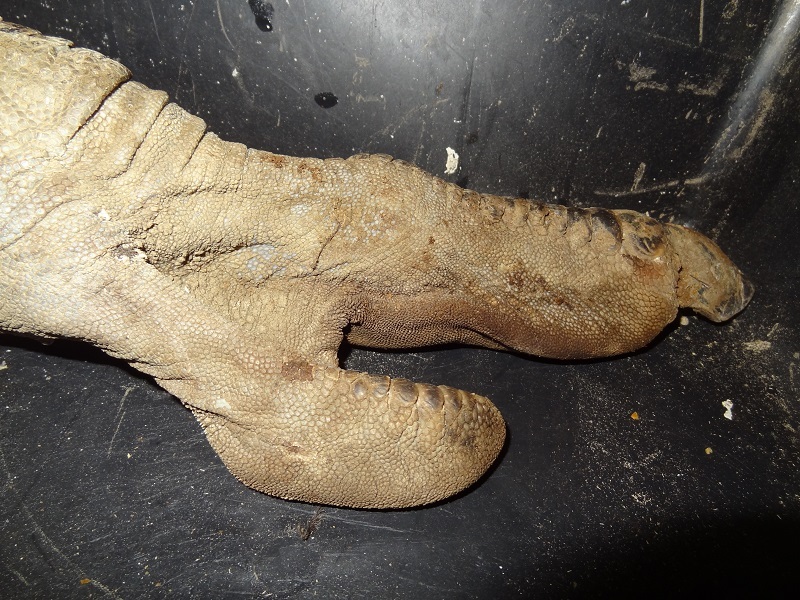 The feet of the ostrich are weird, even grotesque compared with normal bird feet. 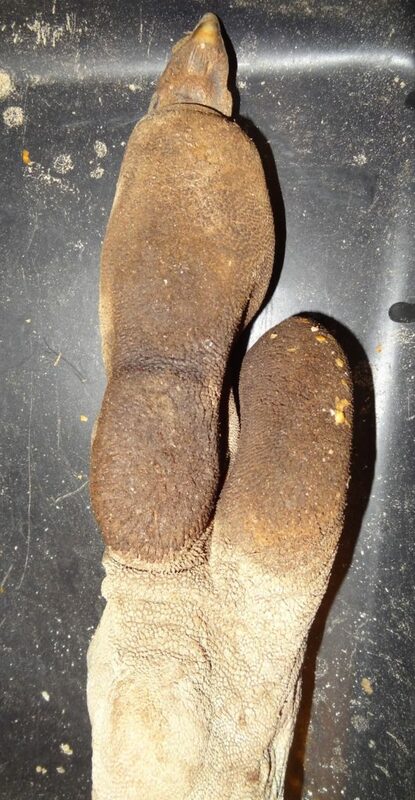 They are quite likely the most derived feet of any extant flightless bird. Functionally they are closer to the feet of an ungulate than to those of a typical avian. 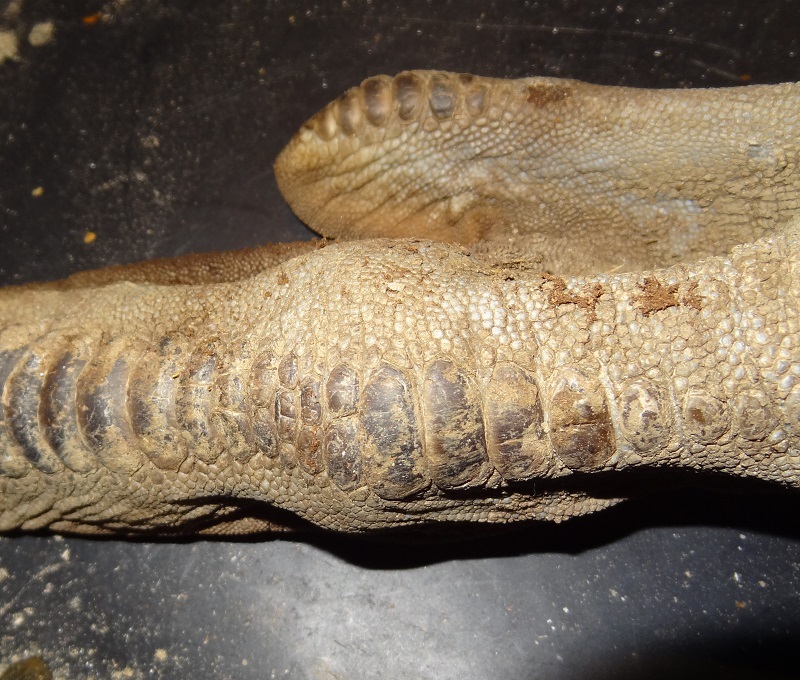 The first toe is enormous in size and has a wide and nearly hoof-like nail whereas the second toe is much shorter, flattened and has no more claw at all. 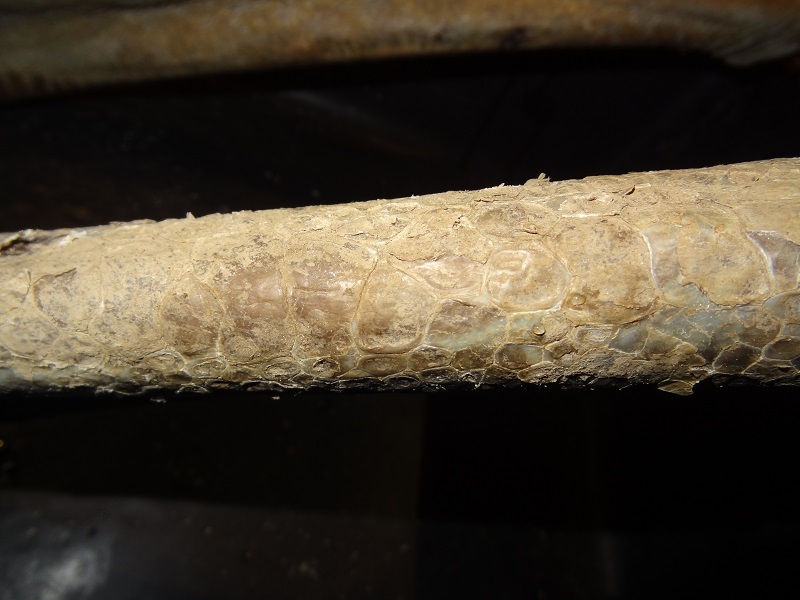 Instead it has a very tough and robust skin with soft pads at the proximal bones. Those pads are made of rounded fat deposits which are embedded within the surrounding connective tissue. The second toe reminded me a lot on the soft-padded toes of camels. The dissection and removal of the skin from this toe without a lateral cut was just awful, and I am not willed to do this ever again. 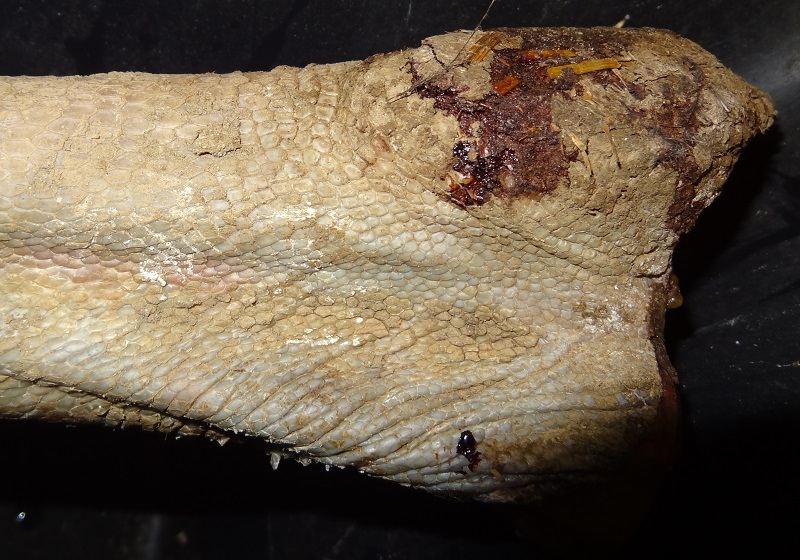 If you ever wanted to know how an ostrich legs looks like witout skin – here it is. At this stage the soft tissue had already dried and shrunken and the massive sinews had lost a lot of their original thickness. Before you continue reading I have to apologize for not using that many references and super-correct descriptions for the underlying anatomy of the foot and leg. I really wanted to focus particularly on the scales, and the very large number of photos here made it already quite time-consuming to write the blog post. As there was also a lot of discussion about this topic, I also hoped to finish it today. If I find some more time, I´ll try to make an edited version with some more background information. I also realized when I wrote this that I had lesser usable photos than I thought, because the quality of some of the photos I took was not good enough. 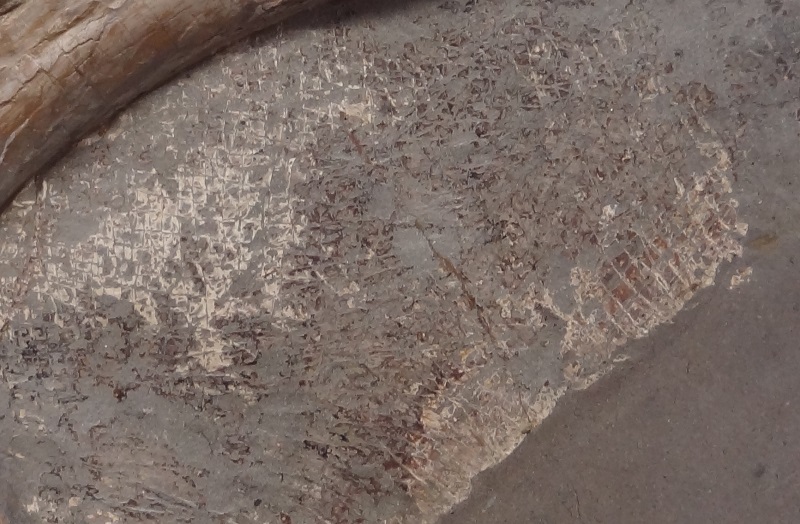 What I found particularly interesting was the large variation of different scale types on different parts of the leg. Of course this is especially good to see in an ostrich, simply because it is such a huge bird. I think that even many people who are familiar with birds are not really that aware of the complex patterns and differences of the scales on bird legs. I write this all also not only to tell you something about the anatomy of modern birds but also as a help for paleoartists to provide some references which could be helpful for depictions and sculpted reconstructions of dinosaurs and prehistoric birds. Luckily we have several really good fossils and also some very nice track fossils which show us partial skin patterns of certain dinosaurs. 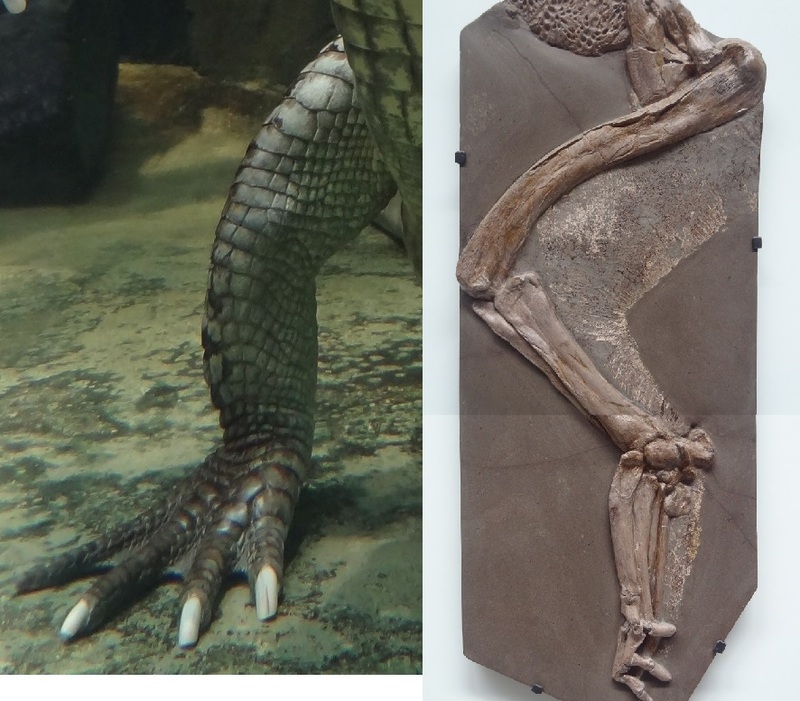 I was quite surprised to see nearly the whole range of all known dinosaur scale variants on this single ostrich foot and lower leg, plus some more which I’ve never seen in a fossil.I thought it would be best to start at the base of the legs and go further down up to the toe tips. There was an area of extremely thick skin at the ankle area. The scales were highly keratinized and formed some kind of knee pad to protect the underlying parts. You can also see how a lot of dirt was pressed in-between the scales of the ankle area. This is the ankle area in side view. You can see the „knee pad“ area and the highy wrinkled and much softer and thin skin behind it. 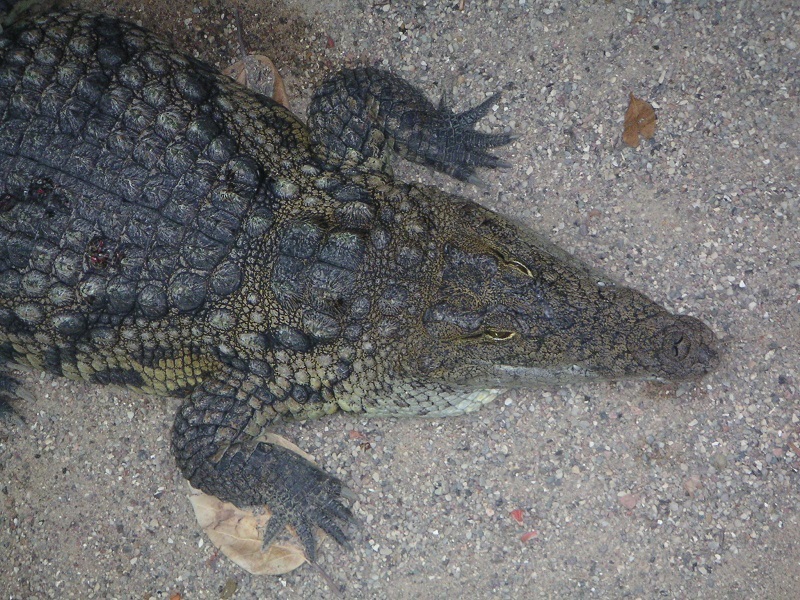 This photo shows the scales at about the midle of the leg. 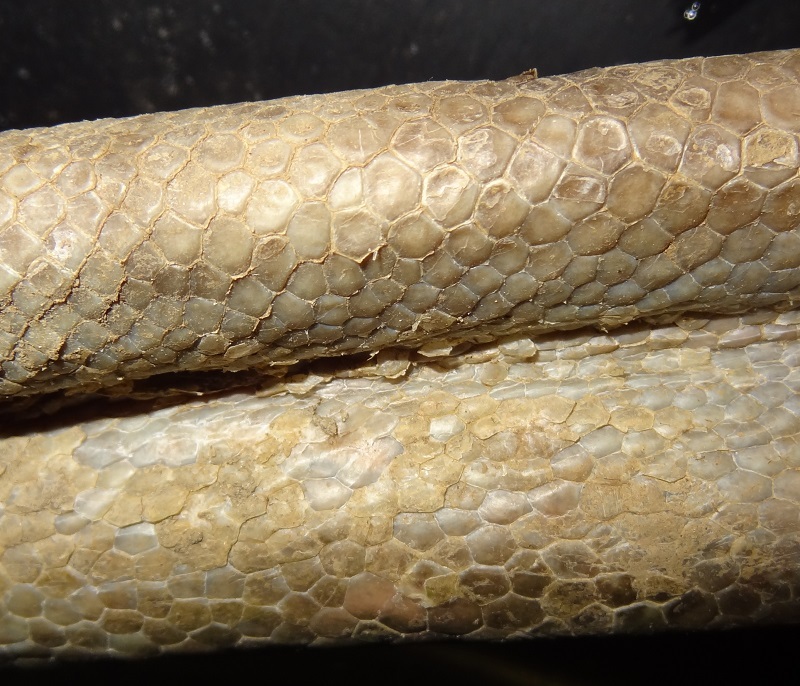 If you take a close look you can already see how the scales differ at the front side and back side. I found this scales especially interesting, as they have quite well pronounced bumps. 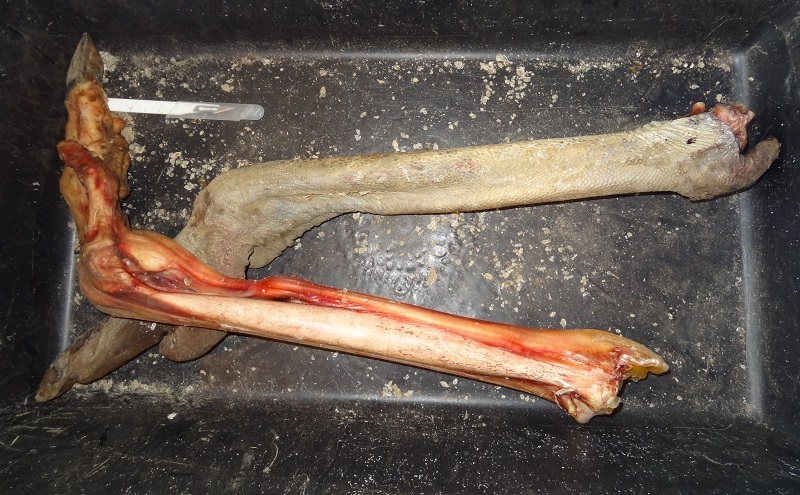 Those lower legs consists nearly only of bone and giant sinews wrapped in skin. 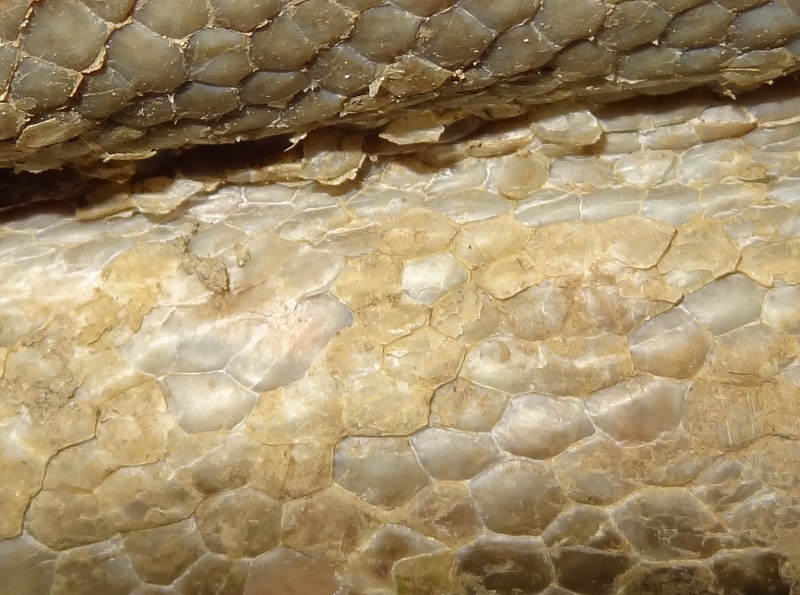 You see here the area where large irregular and somewhat thickened scales are forming into the pronounced scutes. 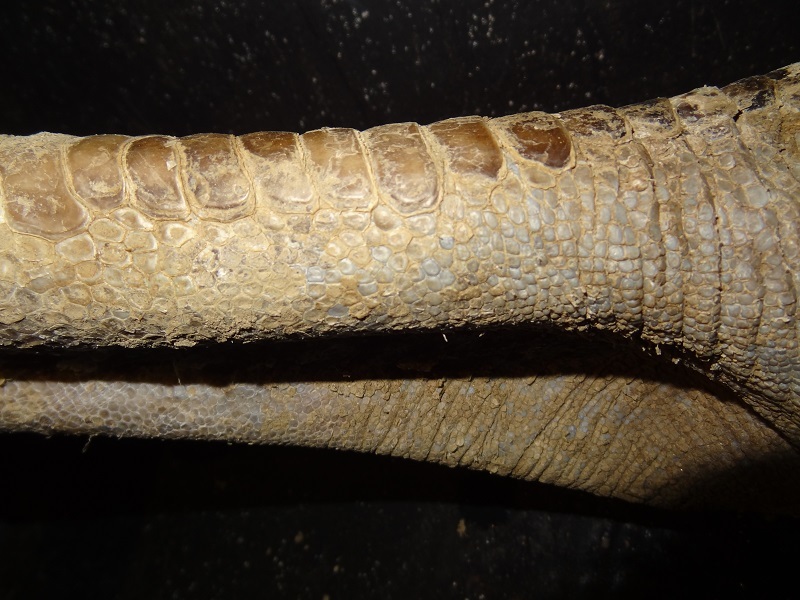 On this photo you can see the large scutes which are located in the area above the foot. 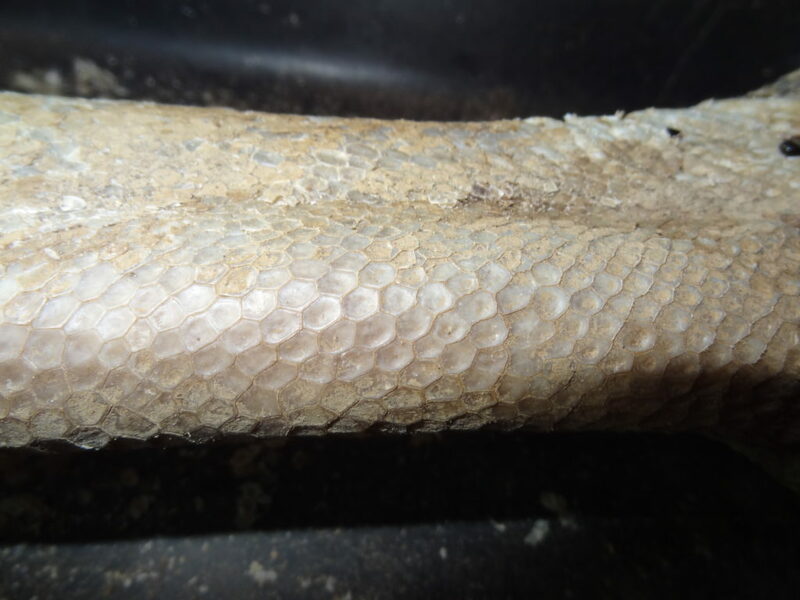 At this little segment you can already see a whole lot of different sizes and shapes of scales. The skin at the backside of the tarsometatarsus is very soft and loose and forms very big folds to allow enough flexibility. Here´s again another view of the whole foot. …just to form again large scales over the big toe. 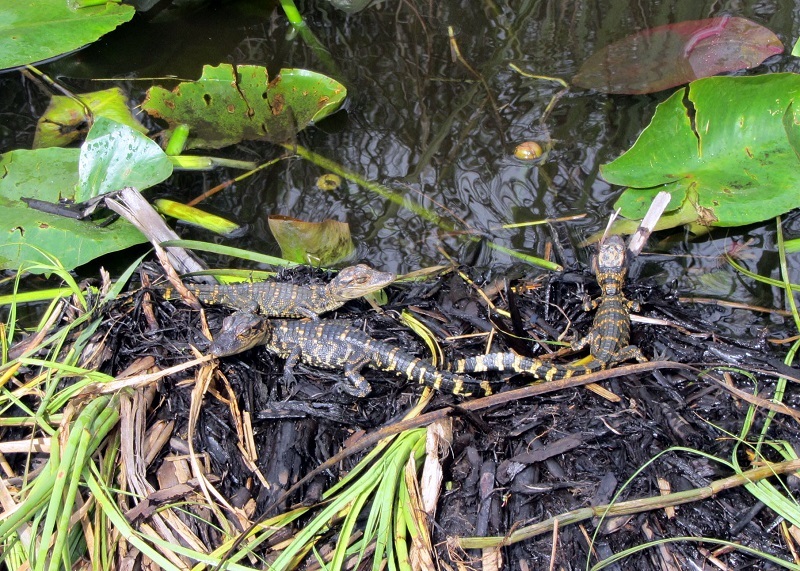 You can again see an interruption of the scutes where they break into a double line of smaller scutes. 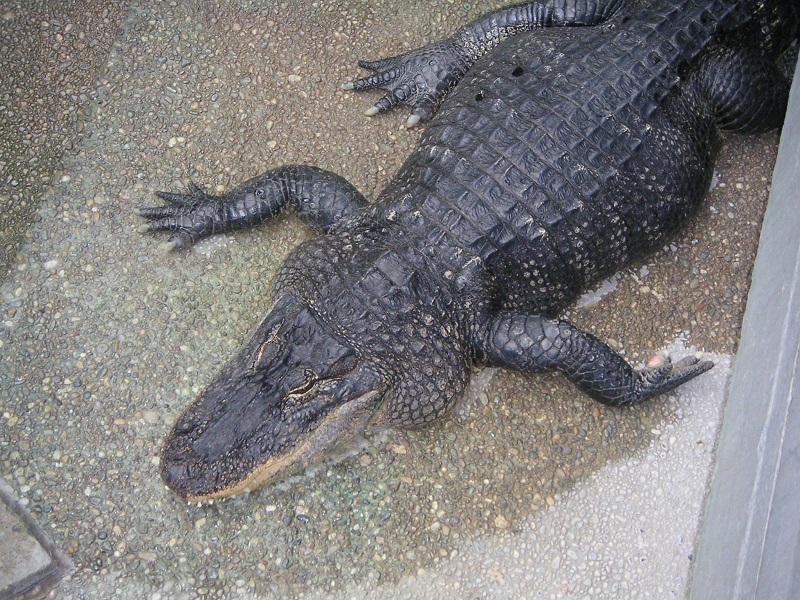 The largest scutes are at the proximal end of the toe and form big shields. Now the smaller lateral too is really weird. 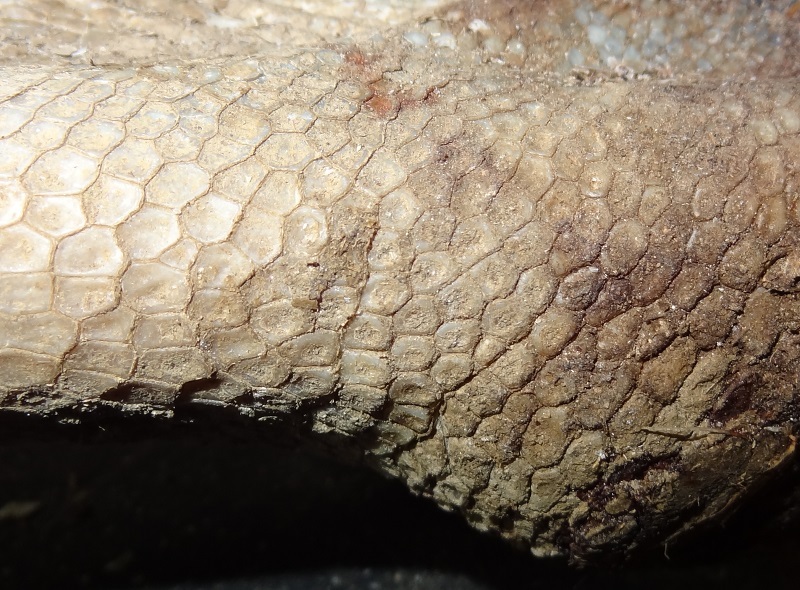 You can see thick and polygonal scales with highly keratinized surfaces on the left which are similar to those at the ankle area. 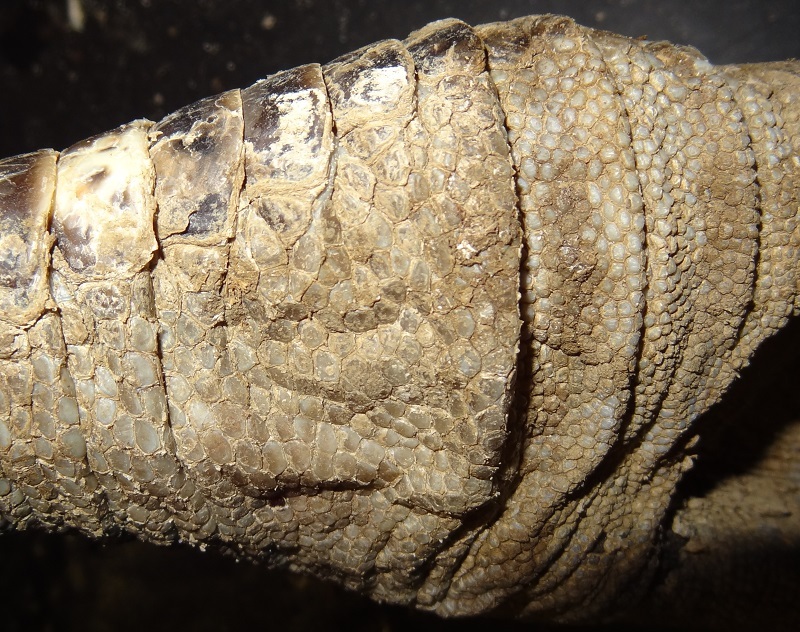 But also their transformation into the large scutes on the upper sides of the toe and rounded, smooth scales with large areas of skin in-between on the sides. Another detail of the photo above. Now let´s take a look at the bottom of the foot. The nail is very short, wide and blunt and feels nearly like a hoof. 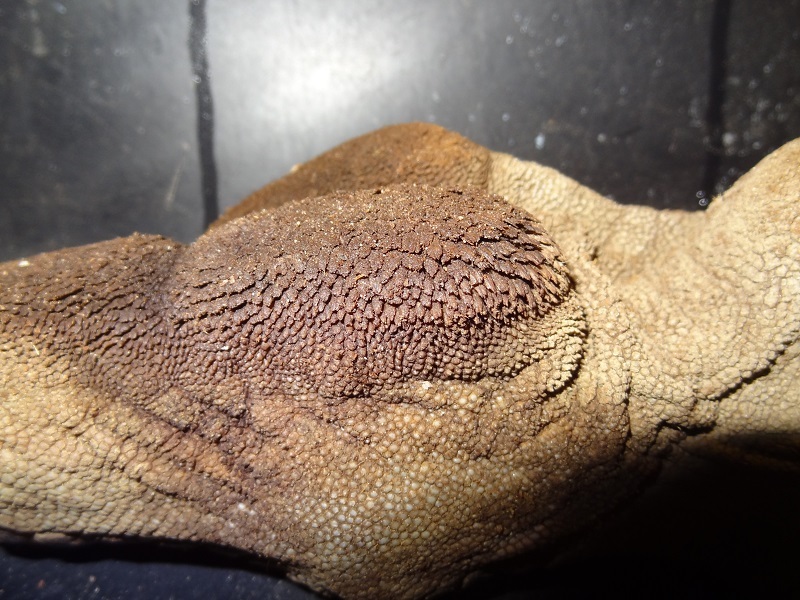 Most of the scales on the sole of the toes are very small and highly keratinized and form dense pads. But what the heck is going on here? 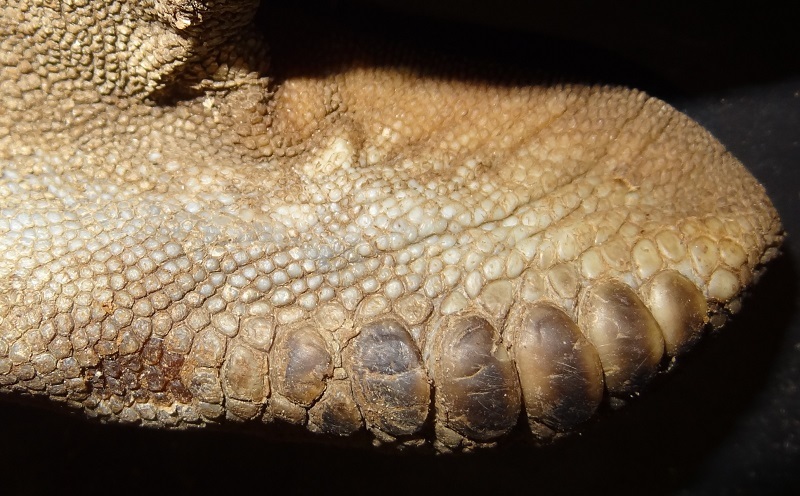 The scales at the centre of the foot form into bizarre upwards turned structures. Now this looks really super-gnarly. Can you imagine how the feet of a large theropod or even sauropod could have had similar or even more extreme scale formations? The area behind this spikey pads is again formed from very small, very irregular scales. This really large number of very different and highly specialized scales is an important reminder that even fossilized patches of dinosaur skin show us still only a small fraction of their bodies. We also have to keep in mind that this ostrich leg is just an ostrich leg and should not be used as a universal reference. The sizes, patterns, shapes and functions of the scales on bird legs are much more diverse than many people think and we can be next to sure that there were also a lot of different scale types present in dinosaurs, even if they were usually not as elaborate and dragonesque as in some modern squamates. 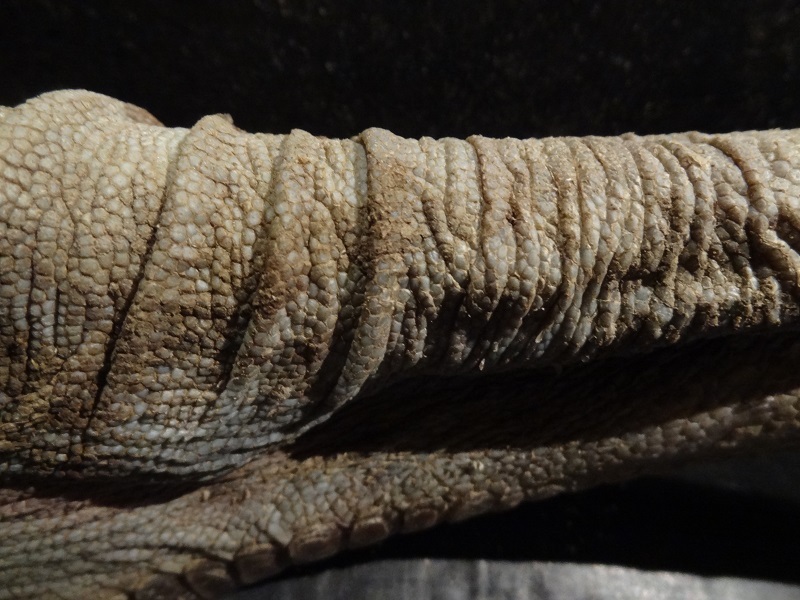 As this topic evoked a lot of interest in recent online discussions about dinosaur skin I decided to write some more blog posts dedicated to this, especially to feature some more non-standard scale patterns on bird legs. Basilosaurus was just big in the news when a new study about its feeding habits and the predation on young Dorudons was published. This is probably a good time to feature a new reconstruction of the „king lizard“ that I just finished. Originally this was not even made to jump on the Basilosaurus bandwagon but I was looking for an animal which I could use for a certain little art project, and it just fitted perfectly, mainly due to its extreme body proportions. But it became quickly more and more complex and the initial little illustration evolved into much more. I wanted to make a reconstruction which included the aspects which I already discussed in length in my earlier blogposts about the cranial soft tissue of archaeocetes and the highly likely presence of facial vibrissae in this animals. Now I want to explain in detail how and why I reconstructed my Basilosaurus in the way I did. I used the famous skeletal drawing of Basilosaurus isis by Kellog (1936) as main reference, however not the original but a modified version by Cameron McCormick with the updated number of vertebrae based on the examination on the vertebrea counting of three overlapping skeletons (Gingerich et al 1990) and a paper by Zalmout et al. 2000. 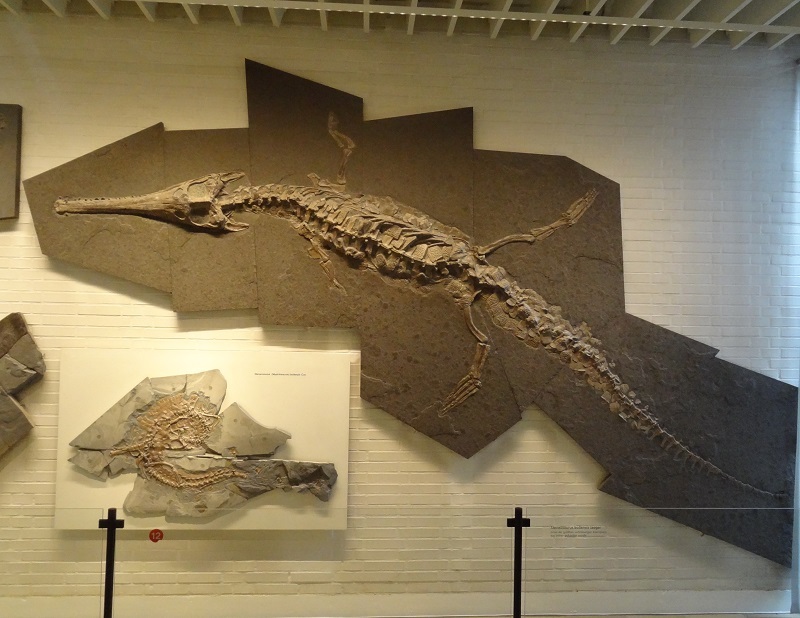 As a result of this, this Basilosaurus became even more elongated than Kellogg’s original drawing indicated. This resulted also in some problems, as the whole body was so strongly elongated that I could hardly work on it on the screen at once. Instead I had to work on sections and resize the view again and again to see how it works. One of the main references for its body shape was the ribcage, which shows us how thick its body was about. As Basilosaurus had an extraordinarily long abdomen, I made it somewhat more voluminous than the chest, similar to what we see in many modern cetaceans. To find the basic shape of the body was the most important thing to start until I went more into detail. I had to change my initial draft considerably when I re-checked the ribcage and forelimbs with the skeleton to get the position if the shoulder girdle in the correct way. Not surprisingly, the head took especially much time to illustrate, as it includes the most detailed features. 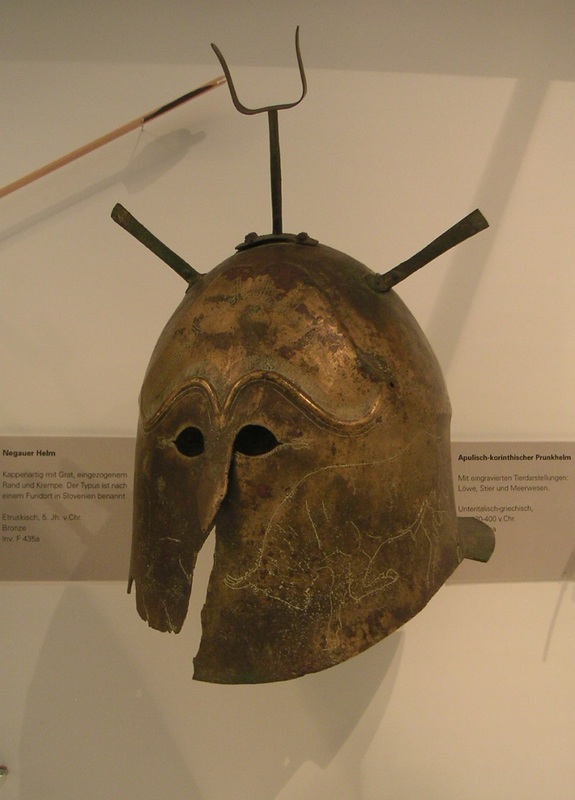 I followed the same considerations as in my earlier cranial reconstruction of Dorudon. The line and corner of the mouth were particularly tricky, and it took a long time and many changes until I was finally happy with it. Many reconstructions of archaeocetes shows them with a very deep corner of the mouth, what gives them a quite reptilian appearance. 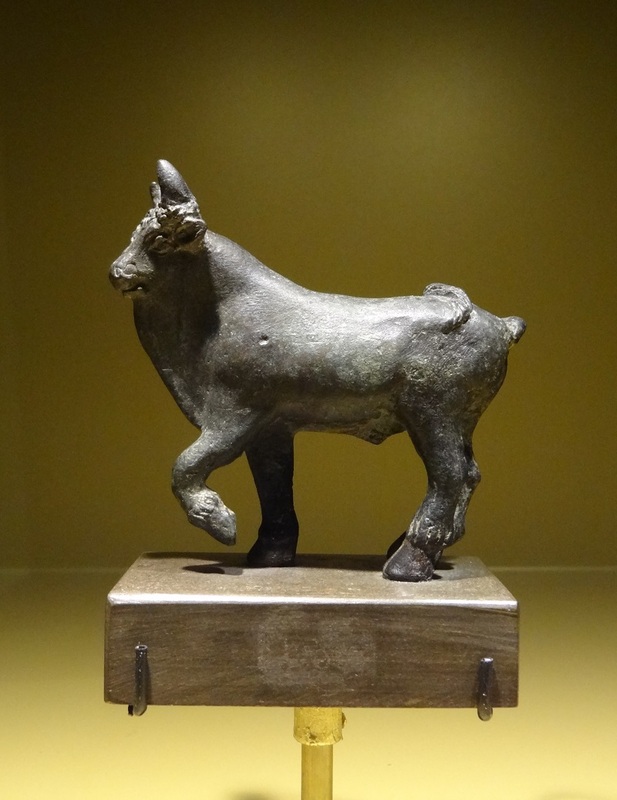 But this animals were mammals, and had after all still the same basic masticatory musculature as us. This includes the masseter muscles, which were quite well developed in archaeocetes. We can see quite well the original position and shape of this muscles from the zygomatic arches. Furthermore there were some other masticatory and facial muscles as well, which affected the shape and position of the corner of the mouth. Basilosaurus with closed mouth. This works only with upper lips. If you have read my earlier posts about archaeocetes, you will know that I am a strong advocate against the common shrink-wrapped reconstructions of archaeocetes with skull-faced heads. I think there are several reasons why we see this type reconstructions so often. 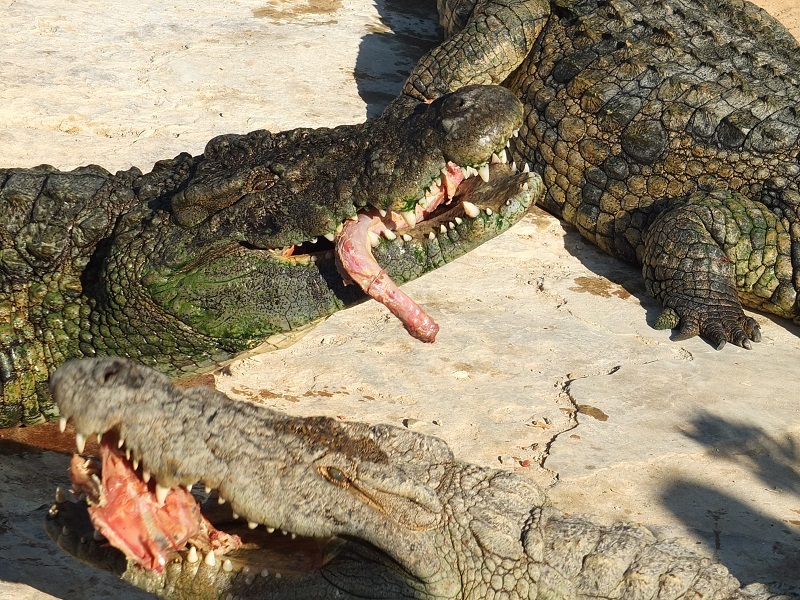 People look at those nasty teeth in the jaws and simply assume that they must have been well visible in the living animal. 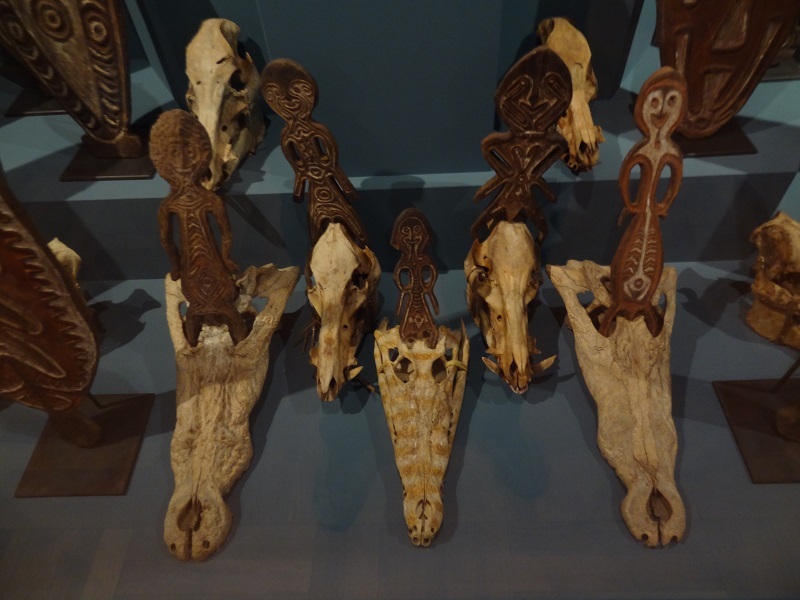 The vague similarity of the skull proportions with those of crocodylians likely contributes to this as well. 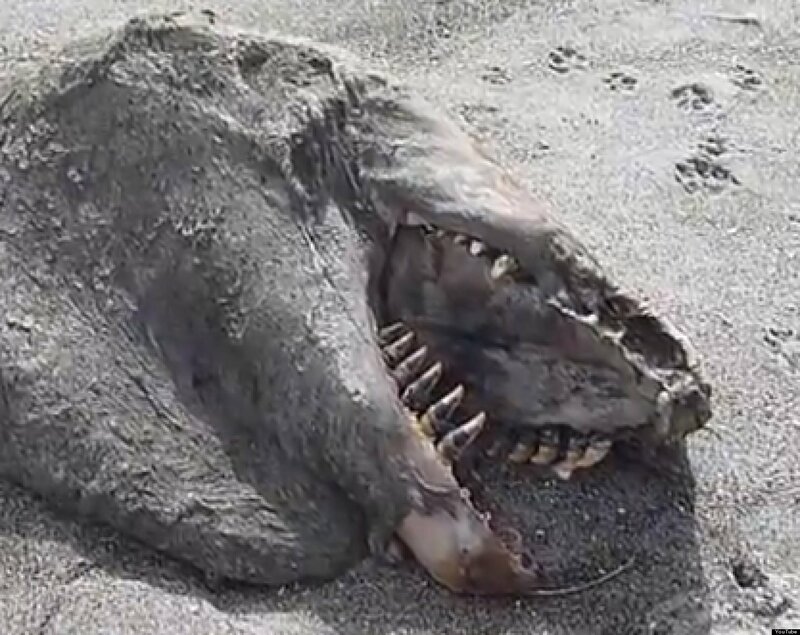 For exactly this reason we see nearly every year cases in which the rotten remains of odontocetes are mistaken for „prehistoric“ reptilian sea monsters, like this orca carcass from New Zealand. Another important point is that artists usually like drawing teeth, and depicting an animal in a badass way is clearly preferred over a „lame“ look in many cases. I was actually surprised how awesome and badass those formidable Basilosaurus teeth still look in the final reconstruction, even with the upper teeth fully covered by the upper lips. 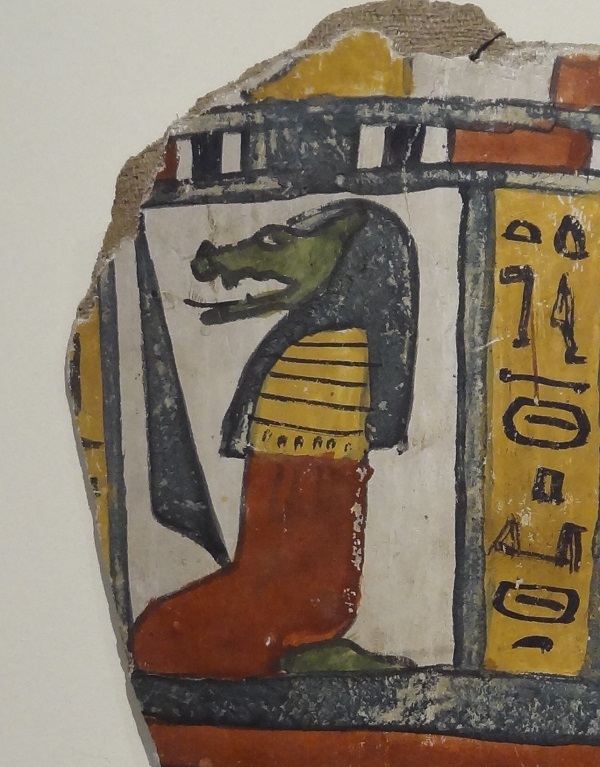 It looks now much lesser than the usual crocodile-faced depiction with bare upper teeth. I think most people don’t realize that a lipless Archaeocete could never close its mouth. 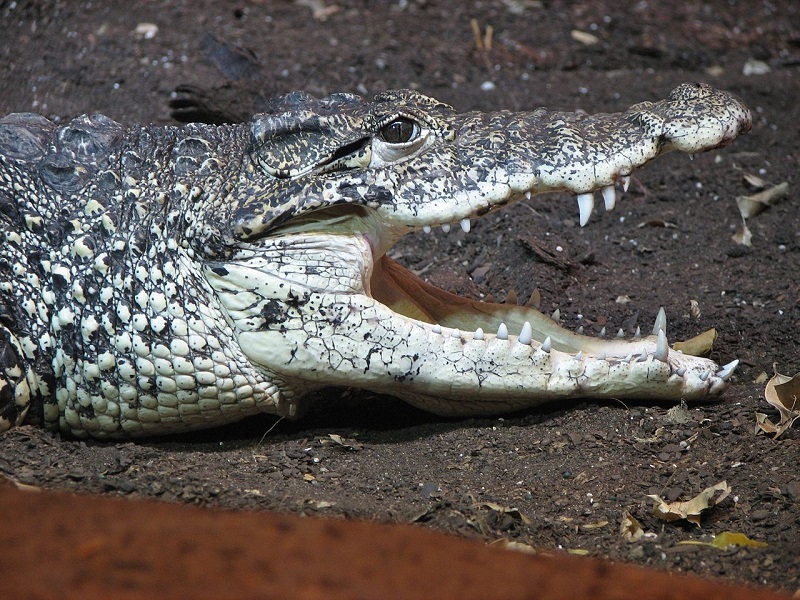 Even when its jaws would be fully closed the teeth would be still fully visible and the cavity of the mouth constantly in contact with the surrounding water. 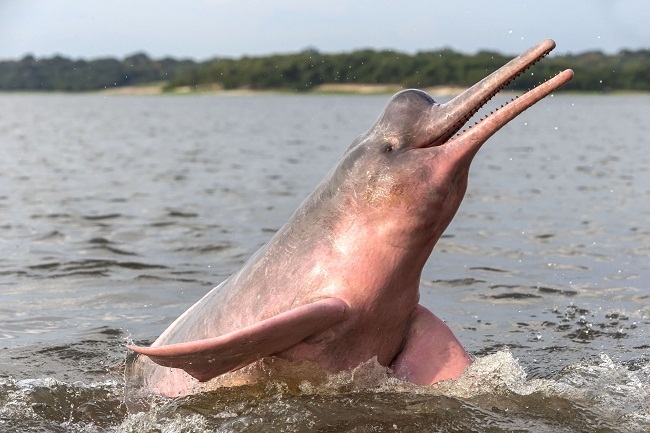 We see such a condition only in some few highly specialized modern cetaceans like the Ganges river dolphin or the pygmy and dwarf sperm whales. But nearly all other odontocetes have upper lips and cheeks that cover their upper teeth (except of course oddballs like narwhals, but the still have lips). Even odontocetes with large teeth like orcas and false killer whales have fully lip-covered upper teeth. We can be also quite sure that the most archaic and still amphibious whale ancestors had lips as well – like other artiodactyls and mammals usually do. It would be really weird if archaeocetes reduced and even lost their upper lips and their descendants re-evolved them later again. It is also surely important to keep in mind that the general jaw shape dentition was not even that different between the early amphibious forms and the fully marine archaeocetes like Basilosaurus. So lips surely did work around this arrangement and shape of teeth. What’s just uncertain is the flexibility of those lips and when archaeocetes had still more flexible and perhaps partially retractable lips similar to seals and when already stiff lips like most modern odontocetes. Perhaps the later forms in-between had a somewhat similar condition as we see in beluga whales. I tried to place it somewhere in between. This shows how the reconstruction was directly made over the original skeleton to get the proportions right. I also added some vibrissae on the top of the snout and upper lip, at top of the mandible and a few ones behind the nostrils. 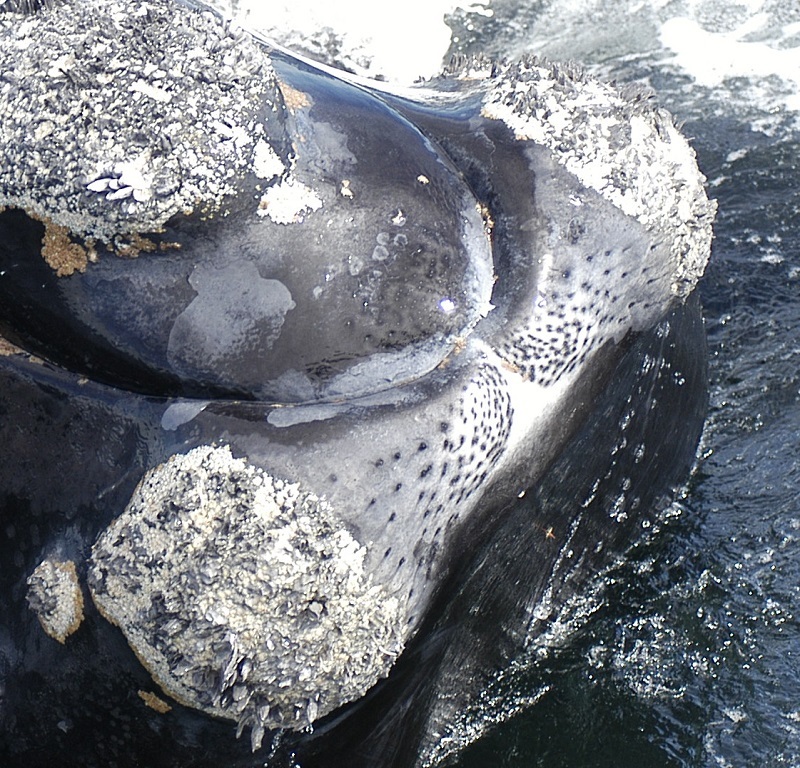 This are the areas where we still find vibrissae on modern baleen whales and in hippos as well. 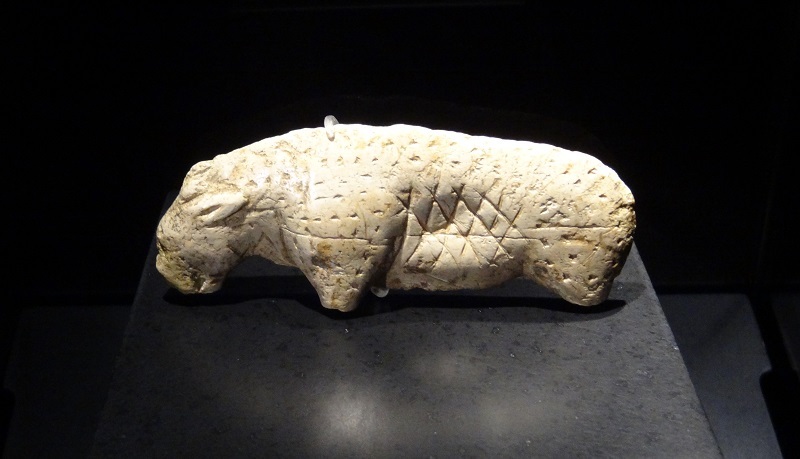 The whole topic of vibrissae in archaeocetes is quite complex, if you want to read more about it, take a look at this older article. Take your fingers and touch your nose. Seriously, do it. Touch it on its back, at the base, the sides and the top. Move it. What do you feel? You will feel your Os nasale, the different cartilages on the sides and on the tip, and you will also feel the tiny muscles which can use to move the sides of your nose. We humans have somewhat weird looking noses, but they have still the basic mammalian nose structure with a lot of soft tissue over the skeletal opening of the nasal cavity. 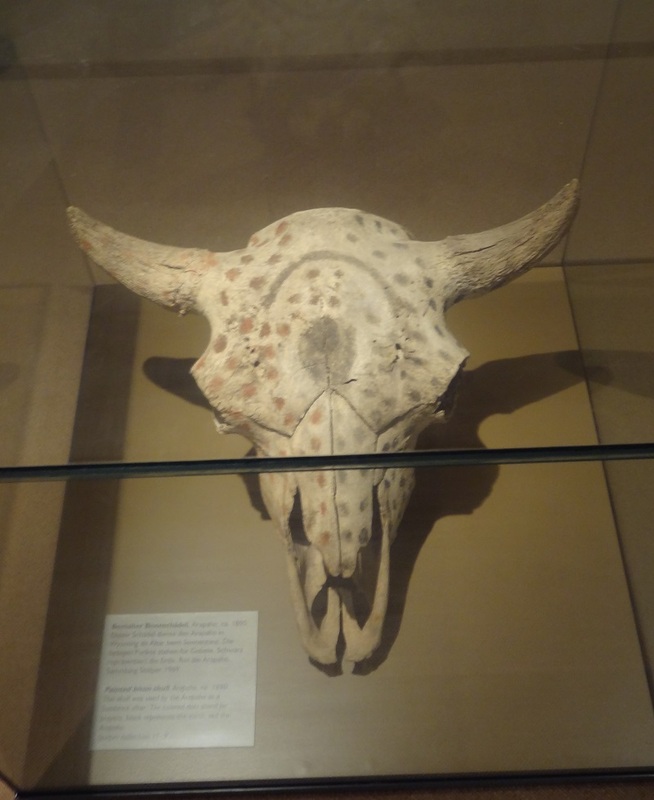 For some reason comparably many reconstructions of archaeocetes simply follow the outlines of the skull and only show some small openings directly over the nasal cavity. But where are all the other parts of the nose? In odontocetes, we don’t see much more than the blowhole as all the other parts of their complex and asymmetrical nasal elements are hidden within the rounded melons on the top of their cranium. 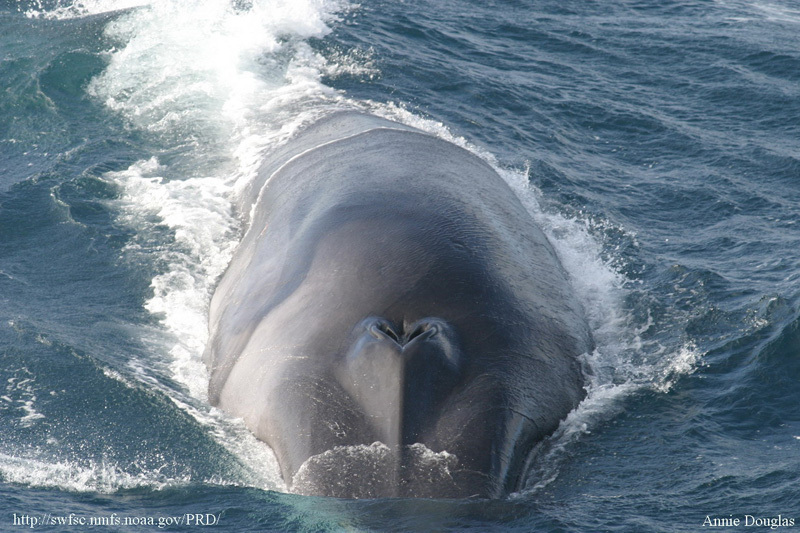 The only exception is the sperm whale which has a well visible lump of tissue around its blowhole which is – unique in cetaceans – on the left side on the very top of its giant spermaceti organ. 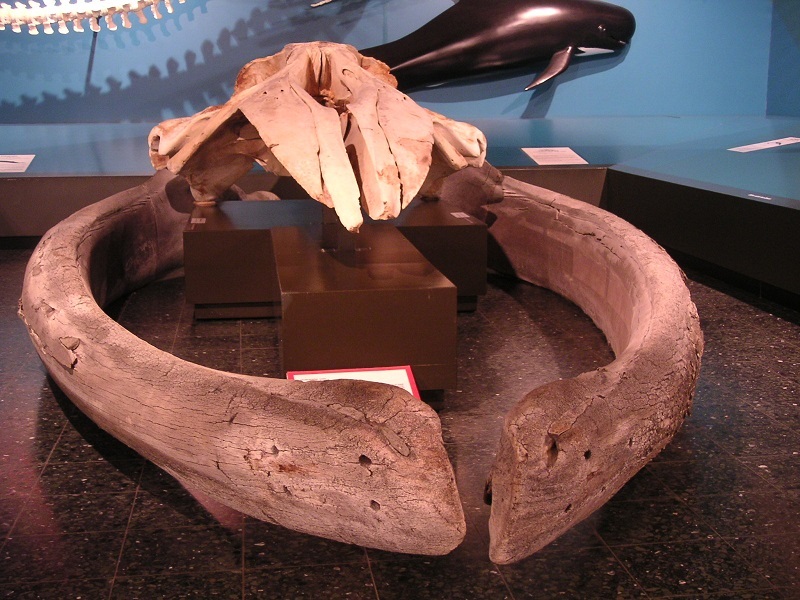 Baleen whales are a much better comparison with archaeocetes here. 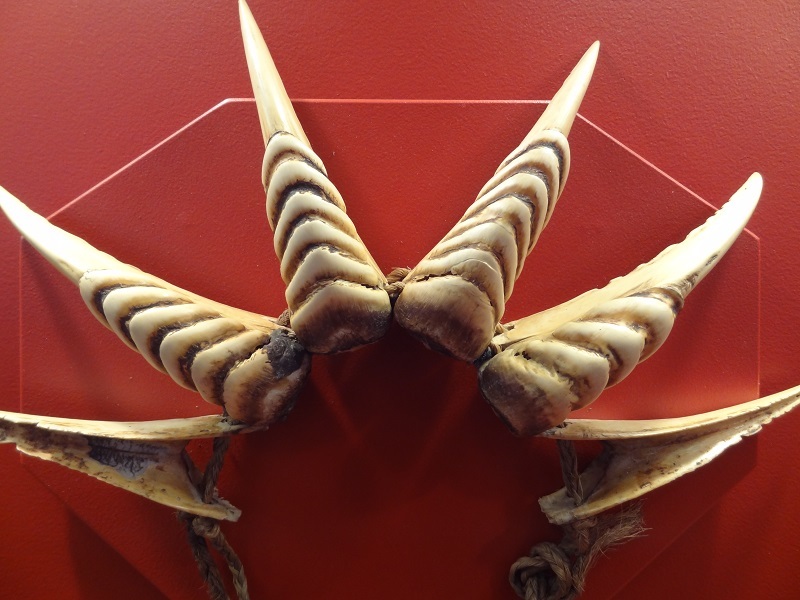 They lack the melons of odontocetes and have comparably little soft tissue on the top of their skulls. So the dorsal shape of the head is still quite close the the underlying skull – except for the fleshy hump which includes the two blowholes and the accompanying cartilages and muscles. The fleshy nostrils of a breathing fin whale (Photo from Wikipedia Commons). Compare it with the blue whale skull above, there is really a whole lot of soft tissue over the opening of the nasal cavity. 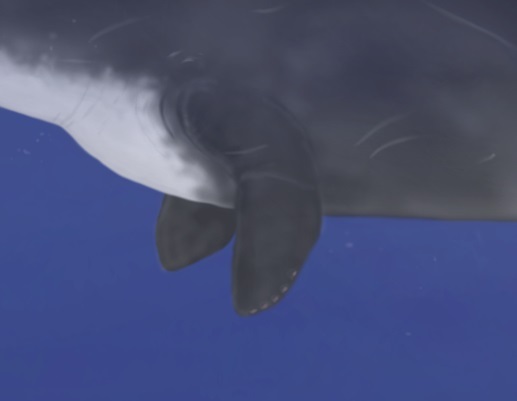 The neck of archaeocetes was still longer and much more flexible than those of modern whales. But this still does not mean that the head and torso were as strongly separated as we see it in some reconstructions. I made the neck and throat similar to those of a seal, with a slight indication where the neck ends and the thorax begins. 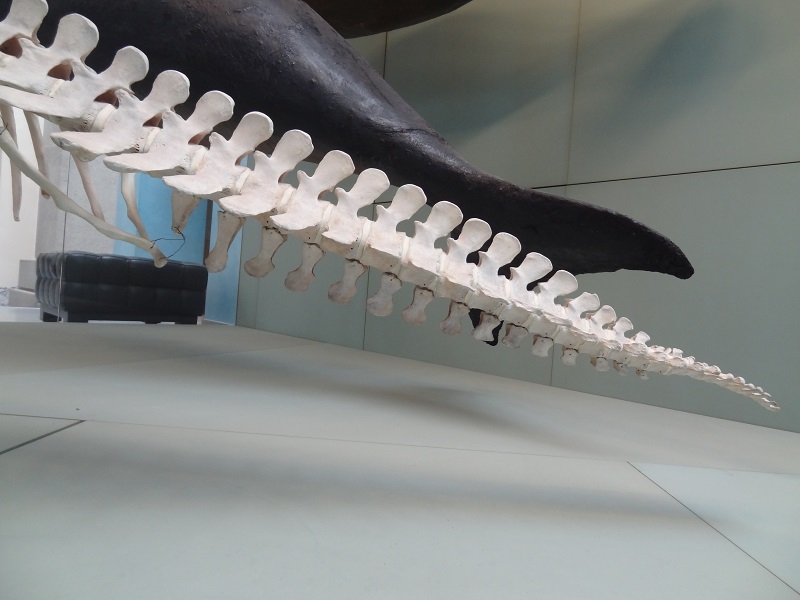 In odontocetes with quite flexible necks like belugas, snubfin dolphins or Amazon river dolphins we see also comparable shapes, which differs from those if other whales with stiffer necks. 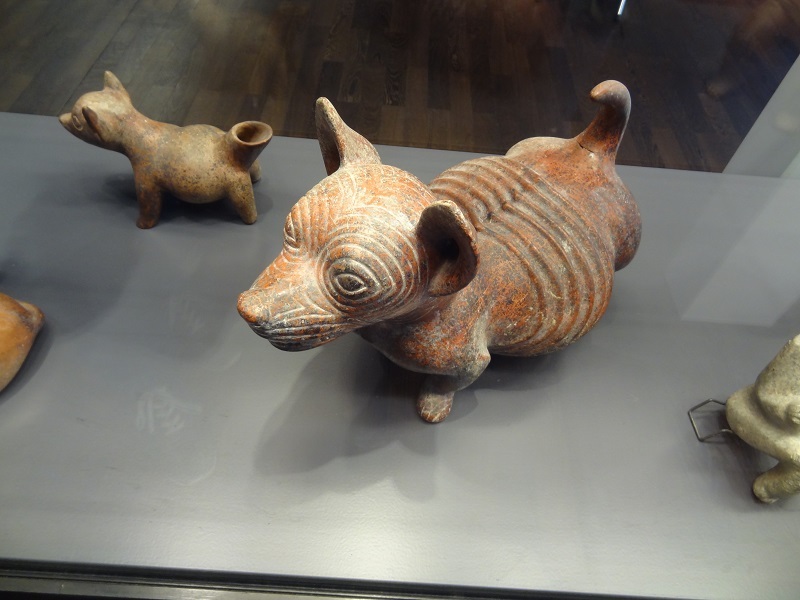 Some reconstructions of archaeocetes have quite weird looking skinny necks which strongly separate the head from the body, what´s again not likely at all. 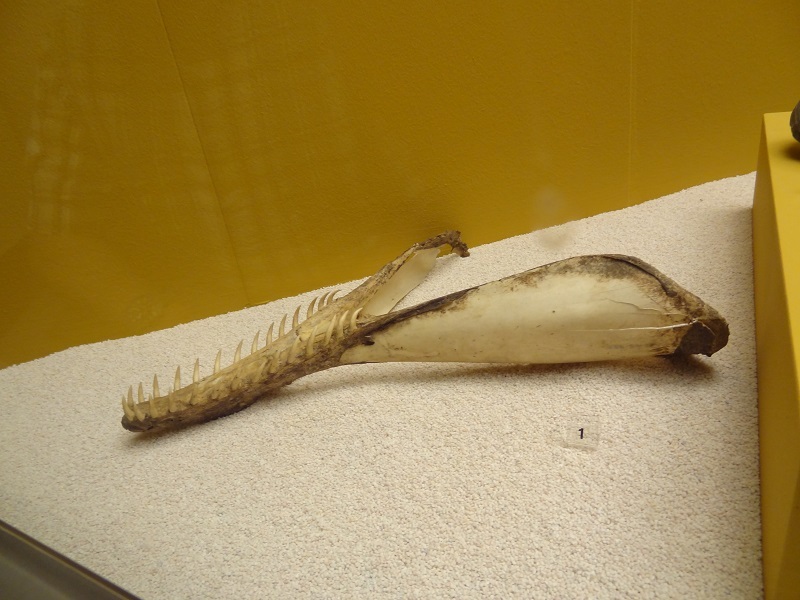 The forelimbs of archaeocetes like Basilosaurus were still surprisingly underived compared with the flippers of modern whales and even the forelimbs of seals. They are comparably long and show neither really strong attachments for muscles nor elongations of the fingers. The reason is possibly the fact that archaeocetes had not that much use fore their forelimbs. 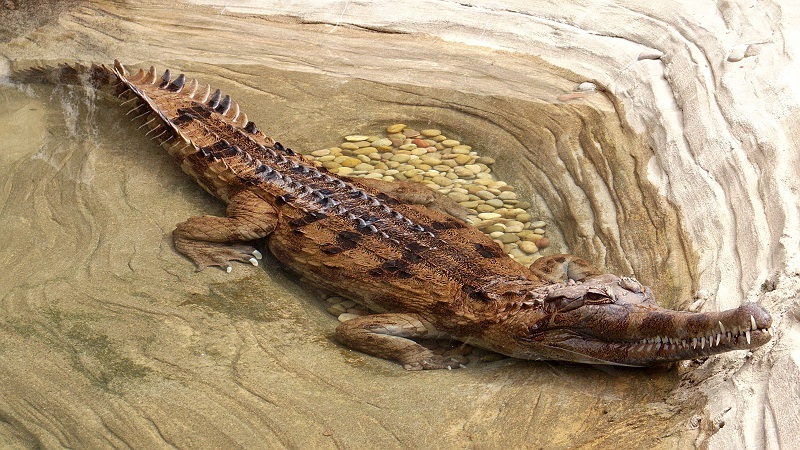 The basal amphibious forms used their strong hind legs and tail to swim and maneuver underwater, similar to many modern amphibious mammals like otters, beavers, nutrias or even desmans and water opossums. In those animals we find often well developed webbing of the hindfeet, but much lesser on the fore feet. We see the probably most derived adaptations to a marine habitat of a modern „walking“ mammal in the sea otter, which spends nearly its complete life in the water. This surprisingly large durophagous mustelid has only very short arms, whose main function is to find and collect invertebrate prey, and to crush open hard shells and sea urchins with stones. So I decided to reconstruct the forelimbs not as propper flippers but more like the comparably stumpy and leg-like arms of seacows. I also added a more speculative feature, some vestigial nails. I think so far there was no research to examine the proximal phalanges of archaeocetes to see if there is any indication for such nails. Their superficial structure of the bone could probly solve this mystery, to see if there was still any keratinous growth or not. Seal still have claws, which can be pretty big. 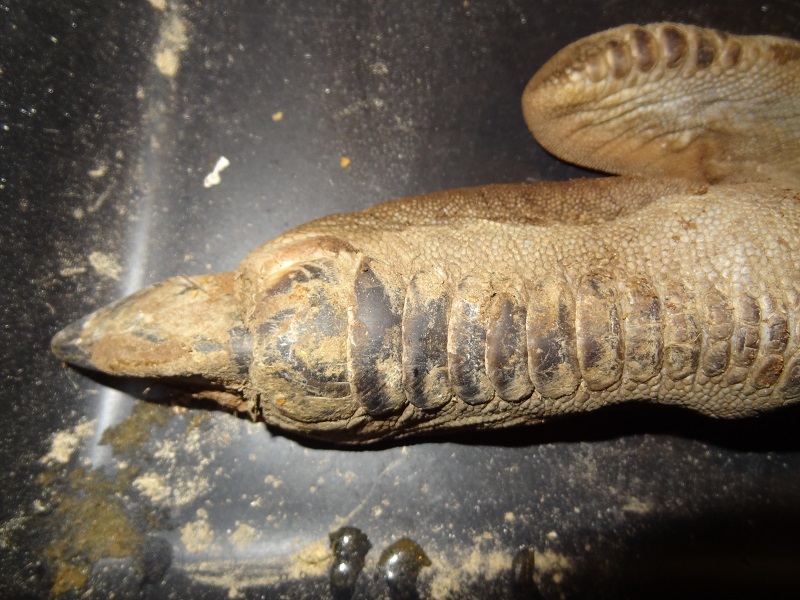 Even the highly modified fluke-shaped hind limbs of phocids have short nails. In seacows, which are even fully aquatic we see small hoof-like nails in their forelimbs as well. 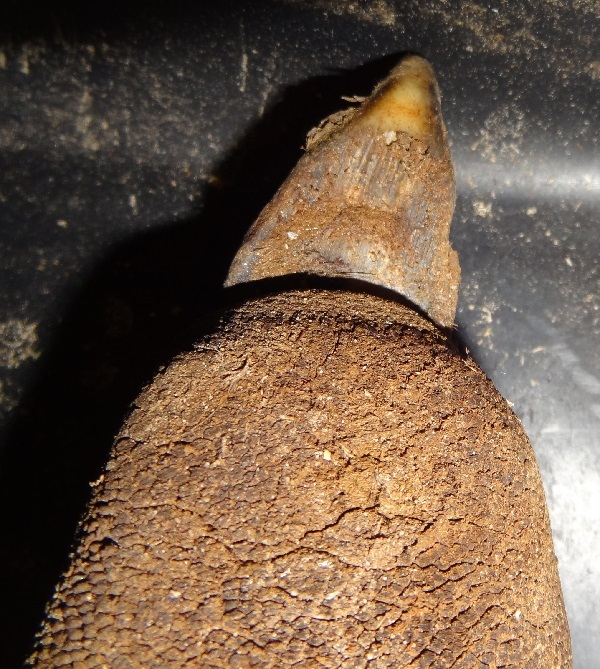 So even if we don’t have direct evidence for vestigial nails in archaeocetes, we have also so far no direct evidence against it, and the idea really does not seem too far-stretched. So I gave my Basilosaurus seacow-styled protoflippers. Basilosaurus tail and fluke reconstrucion. Adding scars to indicate some things which happend in the life of an individual is always fun. 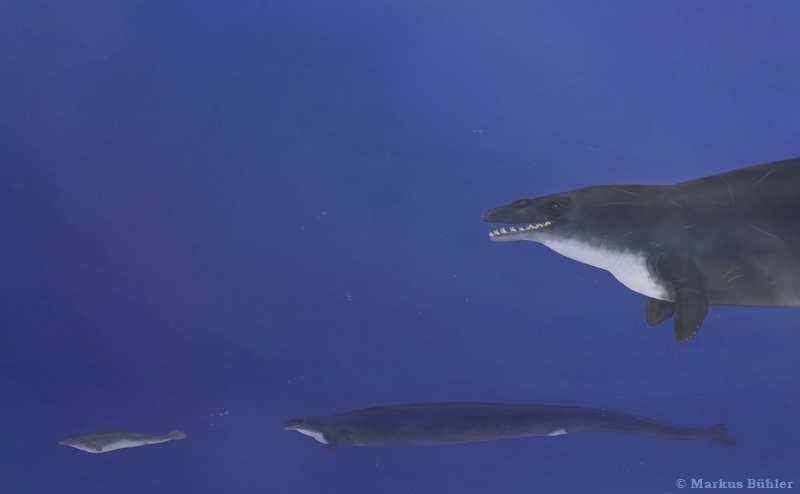 The original version of this Basilosaurus had still a deeper tail and a more conventional shape of its fluke. But I decided to reduce the tail somewhat and make it a bit slimmer, as the dorsal spines of the caudal vertebrae were still comparably short in Basilosaurus. As it also still lacked the caudal peduncle of modern cetaceans I tried to give the caudal fin a somewhat lesser derived shape. The flukes of archaeocetes are really tricky as we can’t reconstruct their shape from the underlying tail vertebrae as in ichthyosaurs and certain mosasaurs or metriorhynchids. Of course we can take a close look at the last caudal vertebrae und see if there’s something going on with them, for example if they are wider and more robust than the vertebrae before them. But this still doesn’t give us really much more information about the original shape of the tail or fluke. 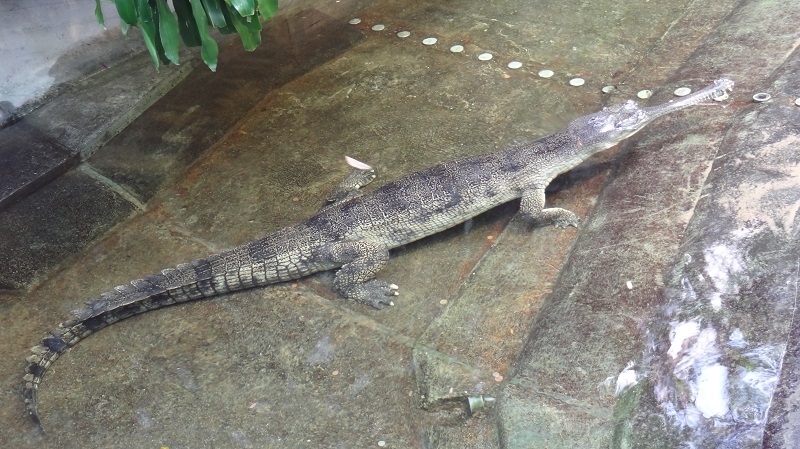 Archaeocetes started quite early to use their tails as primary propulsion and their forelegs were likely mainly for maneuverability whereas their hind legs were already fully useless for swimming. This indicates that a caudal fin was already present in the very early fully marine archaeocetes. But how did it look like? 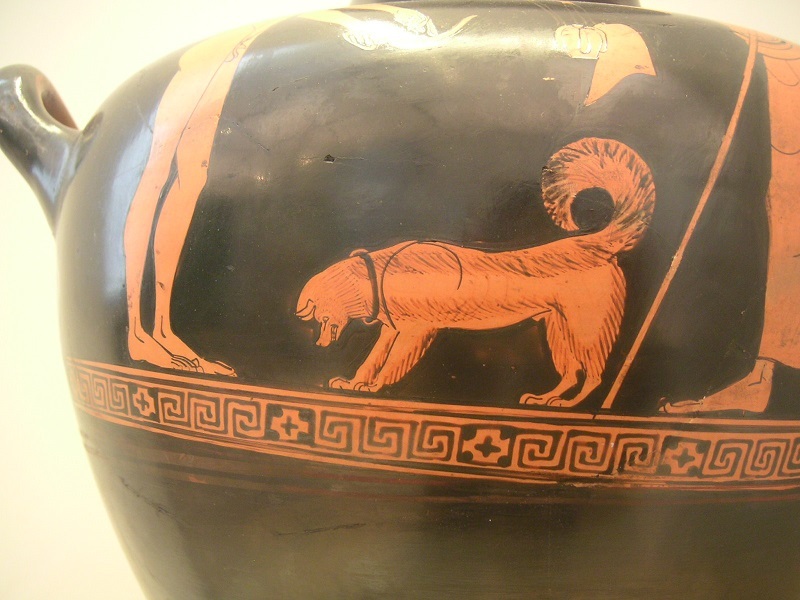 It surely started as a similarly dorso-ventraly flattened tail as those we see in otters and there was also quite likely a stage with a primitive spoon-shaped tail like those of manatees. But the problem is that even with a totally complete line of evolutionary stages between the tail vertebrae of the most basal archaeocetes up to those of modern cetaceans with high dorsal spines, laterally compressed tails and a caudal peduncle for the fluke, we would still don’t know how the caudal fin really looked like. To get a better understanding of this issue we can take a look at seacows. The manatees which mainly populate freshwater habitats in slow moving rivers or coastal areas (but don’t forget, they also crossed the Atlantic ocean anytime) have only a fleshy oval caudal fin, but it seems to work obviously well enough for them. Dugongs which are living in marine habitats are much more affected by turbulences, waves and similar things and have already a nearly whale-like fluke. They spread over large areas of the globe, over Africa, Asia and Australasia what indicates that they are quite seaworthy. 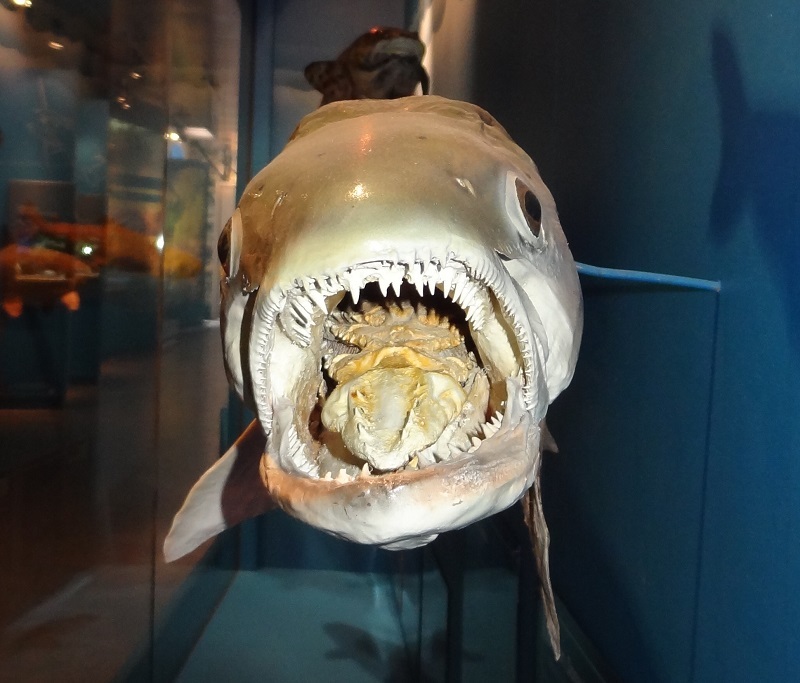 In contrast to manatees they are also much more affected by predation, for example by tiger sharks. In the past they were quite likely also hunted by predatory cetaceans and in some areas possibly also by large marine crocodylians. 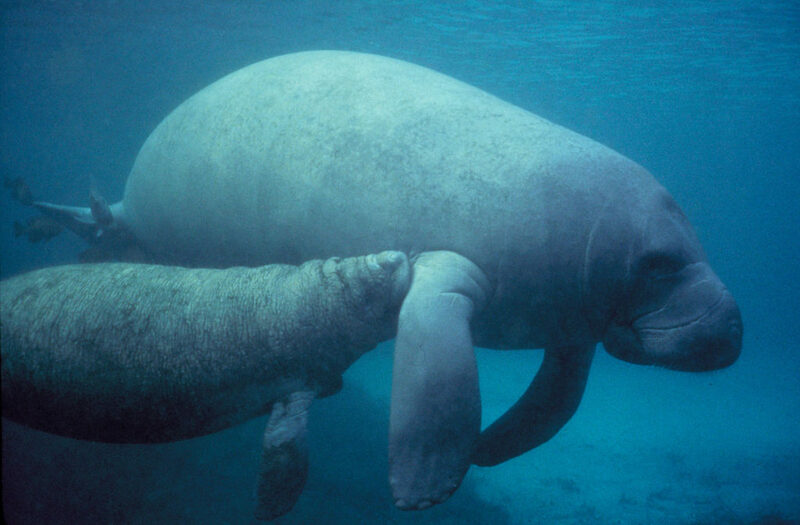 This are possibly the reasons why dugongs appear much more whale-like than manatees, as there was a much harder selection for strong swimming abilities than for manatees. Their caudal vertebrae also show elongated dorsal spines and some flattening of the most proximal vertebrae, but we would probably not expect such a well developed fluke from the bones alone. In direct comparison with those of whales it’s however still somewhat lesser derived. The tail is still comparably wide and the fluke itself comparably thick and fleshy. 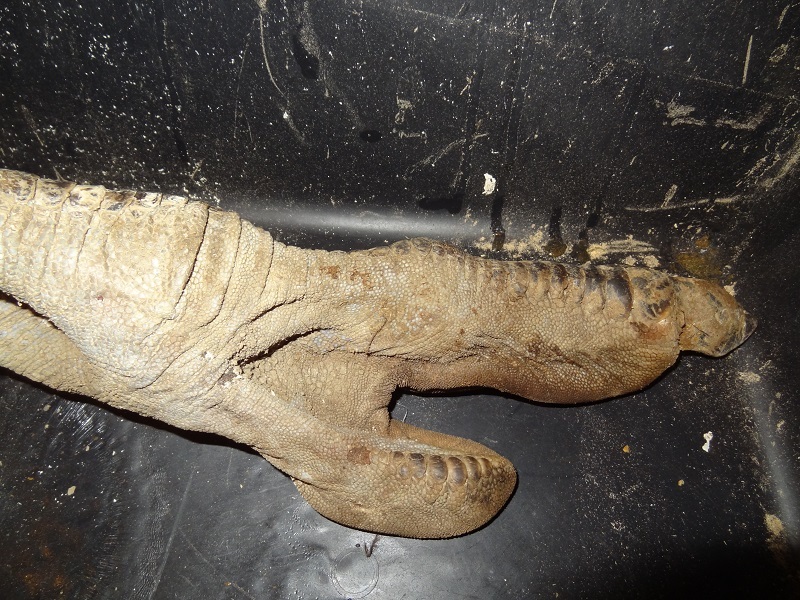 This could give us some insights into the evolutionary history of whale flukes. 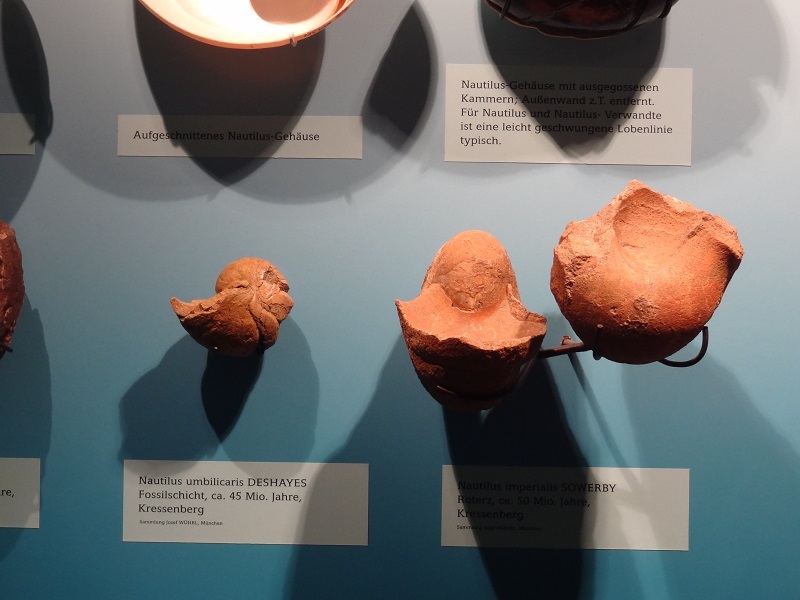 I could imagine that there also was a strong selective pressure on the shape of archaeocetes as already little differences of its structure could have had comparably strong hydrodynamic effects. And we also shouldn’t forget that archaeocetes were unlike manatees or dugongs no herbivores but predators which hunted fast and agile prey. That’s why I tend to assume that highly derived oceanic predators like Basilosaurus already had comparably well developed flukes. So I reconstructed the caudal fin as a real fluke and not like manatee paddle, but still different from those of modern cetaceans. It’s still thicker, somewhat longer and more rounded. My very first version was still closer to the flukes of extant cetaceans but I wanted to keep the differences in vertebra shape more in mind and make this also somewhat more obvious in the external shape. I also gave my Basilosaurus no dorsal fin. 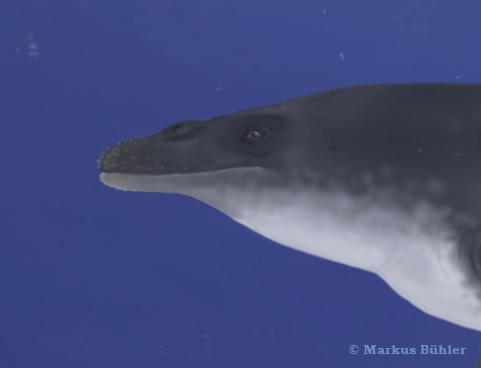 One reason for this was because I wanted to make a bit similar to right whale dolphins, little known odontocetes with a very thin and long body, which fully lack a dorsal fin. 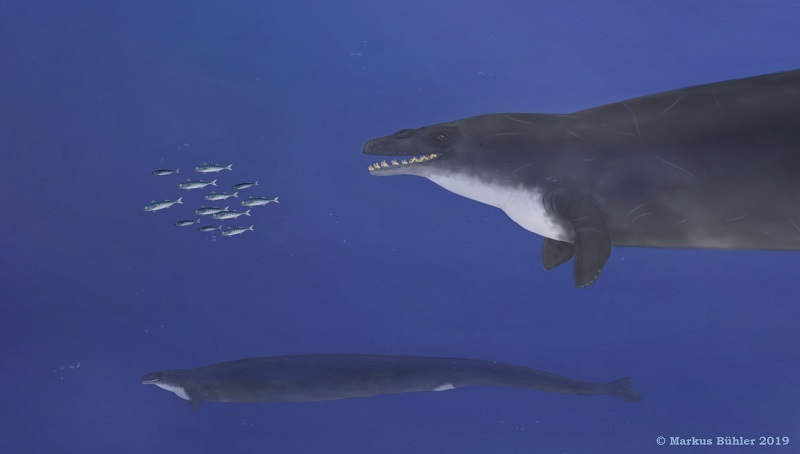 Another reason was to depict the Basilosaurus as different and more primitive compared with modern whales. However, we have to keep in mind that baleen whales and odontocetes diverged already very early in cetacean evolution, and both do have dorsal fins. So this means that those most basal ancestral baleen whales had either already a dorsal fin (perhaps a very primitive one at least) or that dorsal fins evolved later parallely in both lineages. That´s some food for thought. The coloration of prehistoric animals contains for obvious reasons an especially big amount of speculation, unless we have cave paintings or exceptionally well preserved fossils which can give us some direct evidence for the patterns and colors. In the case of Basilosaurus we have at least some extant relatives, but they can give us still only a vague hint about the colors and patterns of prehistoric whales. I wanted to avoid just another Basilosaurus with the colorations of the Walking with Prehistoric Beasts Basilosaurus. It really doesn’t look that bad and it’s not implausible but I just wanted something different. I’ve discussed the coloration of large marine animals for the paint job of the Meyerasaurus by my friends of kamyk.pl for the museum at Lodz at length here. For the Basilosaurus I also made a first version with a similar color scheme that was somewhat reminiscent to those of a leopard seal. 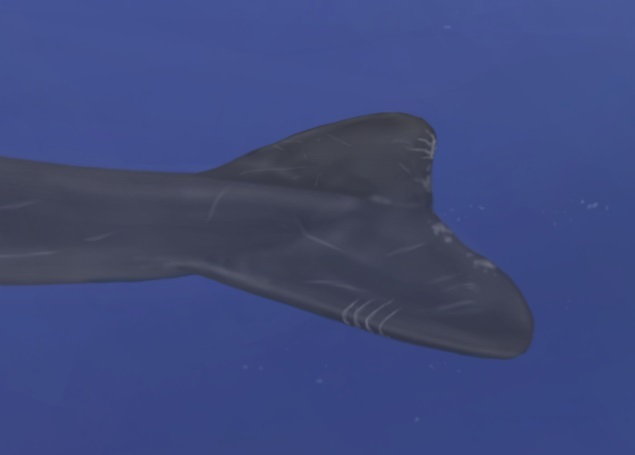 Then I tried a more homogeneous and darker main color which was inspired by false killer whales and long-fin pilot whales, which have also quite elongated bodies. I also made no classical counter-shading with a generally lighter underside. This is more a trend than a rule and a large number of marine tetrapods, especially seals but also a lot of whales, show no real counter-shading at all. Instead I made the area of the throat visually distinctive with a white patch, something we also find in many different modern whales. Because of the incredibly elongated body of Basilosaurus I made also a small white patch in the area of the small hindlimbs. I could imagine that such an eyecatcher of the genital area could make sense in an animal which had possibly really some obstacles to find the right position during mating. 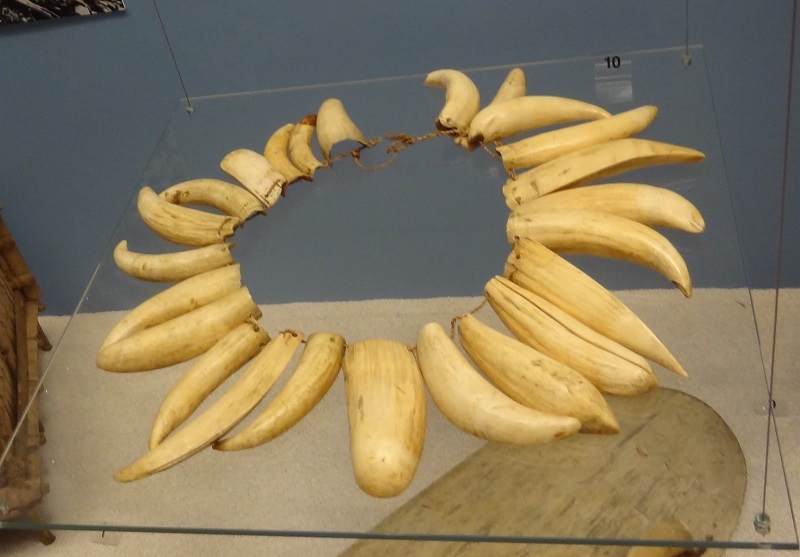 We find also similar white eyecatchers (or, as I call them, cetacean arseantlers) in a lot of very different cetaceans, from right whales to sperm whales and various other odontocetes. This brings us to the next point. One of the great things about digital painting is that you can recombine your work again and again. So I made just another Basilosaurus from the first one, what gave me also some more good chances to depict some other aspects. At first I scaled it down to show the sexual size dimorphism. Male Basilosaurs were about 20% longer than females, based on studies of their bones. 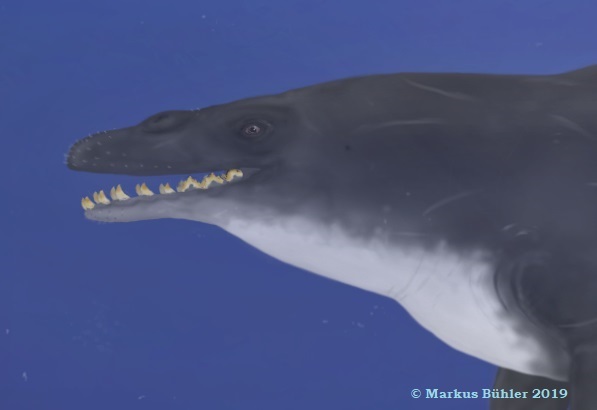 The second Basilosaurus was also a good opportunity to depict it with a closed mouth. Its mouth is now fully shut and the lips make the teeth no more visible. Remember this couldn’t work at all without upper lips, the teeth would be exposed all the time. To make the two somewhat more individual I changed the position of the forelimbs of the male to indicate a certain approaching position towards the female. The male has also a slightly lighter coloration, something we also see in older males of many cetaceans like sperm whales or bottlenose whales. He received various scars as well to indicate some intraspecific fights with other males. This is also a quite common thing in various odontocetes from sperm whales to many beaked whales and a lot of dolphins. Last but not least he got a genital organ as well. In fact this was the very first time that I have ever depicted something like this. But prehistoric animals were not always just fighting, hunting and eating and even a gigantic apex predator like Basilosaurus had a social life and sexual interaction. One could even say that next to everything an animal does, no matter if it’s hunting, eating or fighting, has the main purpose to ensure that it can successfully reproduce during its life. So here we go, Basilosaurs having fun. You shouldn’t underestimate the background fauna. Sometimes it can be somewhat annoying and time-consuming to paint it, but if you have already spent a lot of time on your main subject you can also give it some nice substitutes. You should see the background fauna as a chance and not as a time waster. It gives you a chance to depict some interesting and possibly hardly ever shown species with comparably little effort (unlike a full life-depiction of those animals being in the focus themselves). For this reason you should also avoid totally random stereotypes but really take some time to make a correct depiction. Fish are quite typical elements for background or „prey“ fauna but unless you make a swarm of really tiny and individually unrecognizable fish you should really try to make a realistic depiction. If you are not really familiar with the animal you want to depict, you will very, very easily make errors. I write this because that’s exactly what happened when I started with some unspecified random fish. 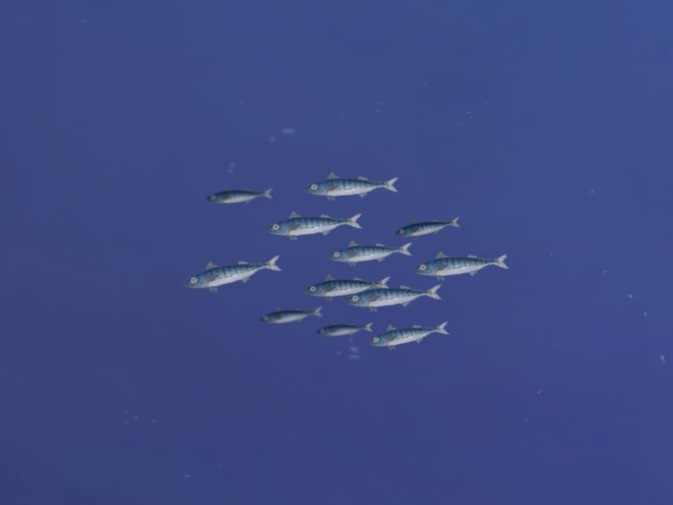 So I was searching for something better and decided to make a swarm of mackerels. 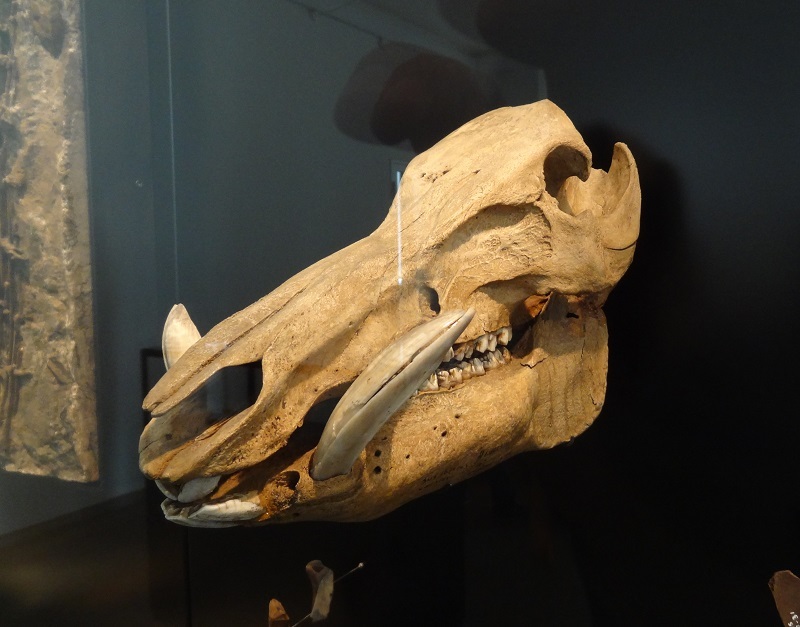 They have a very good fossil record with great specimens from the Eocene which were already very similar to the modern forms. 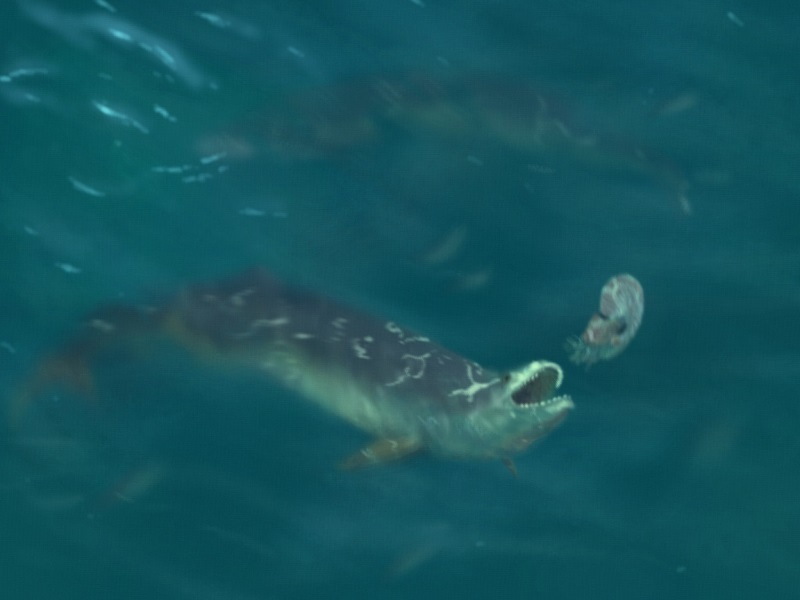 They would also fit within a scenery in the open water and their familiar appearance gives also some more scale for the size of the Basilosaurus. Furthermore I could depict a visually more interesting fish than just one with silver-white colors. There are also some recycled nautiluses in the background to make the fauna a bit more diverse and to add something that appears somewhat ancient and primordial. 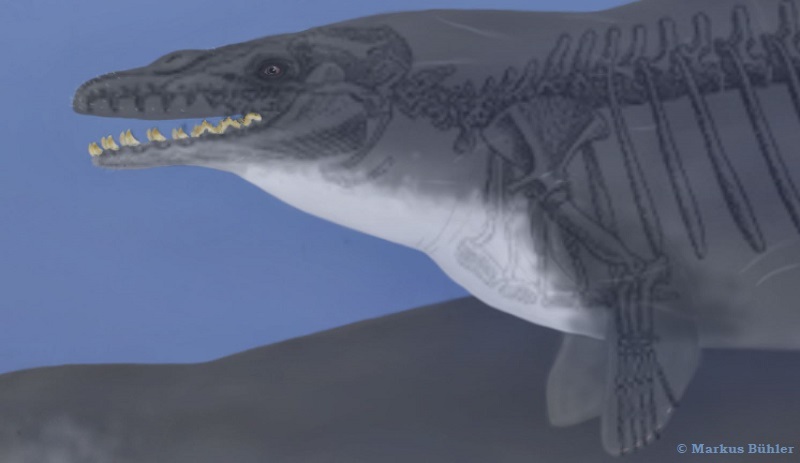 I spent also a considerable amount of time on a Dorudon which was originally only planed as a simple background illustration but at the end it became a similarly detailed reconstruction as the Basilosaurus itself. 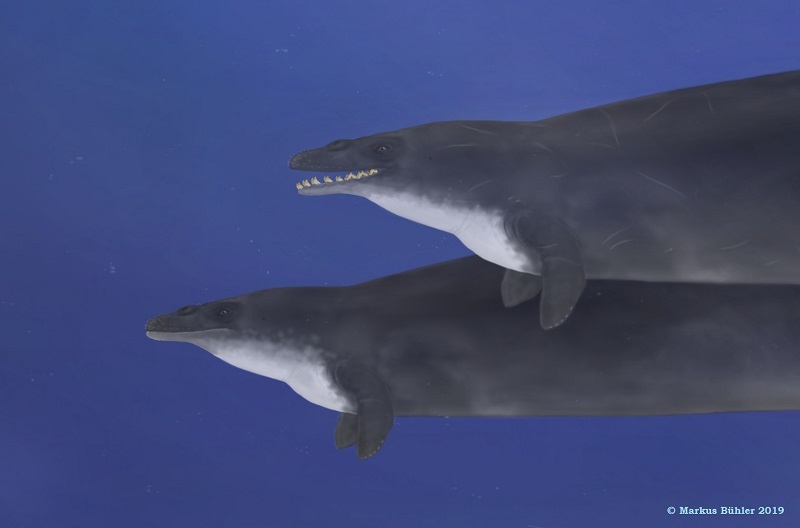 At first I wanted to depict Basilosaurus hunting a juvenile Dorudon, but then I wanted to depict it next to an adult specimen. The skull length of Basilosaurus and Dorudon is surprisingly similar, despite the very different total lengths. Those of Dorudon has however more elongated jaws and is lesser massive than those of Basilosaurus. But this was still a pretty big animal, about as large as a false killer whale, and with really large jaws. What I really want to emphasize here is that I don´t think this particular reconstruciton is the one and only possible. That´s why I wrote where things were more speculative but also why I made it the way I did. Some traits like the upper lips and the vibrissae (perhaps lesser pronounced, but perhaps even more) were nearly certainly present in archaeocetes, whereas other traits like the shape of flippers and fluke or the presence of a dorsal fin are much more of an issue. Gingerich, P. D., B. H. Smith, and E. L. Simons. 1990. Hind limbs of Eocene Basilosaurus isis: evidence of feet in whales. Science, 249: 154-157. Zalmout, Iyad S. 2000. 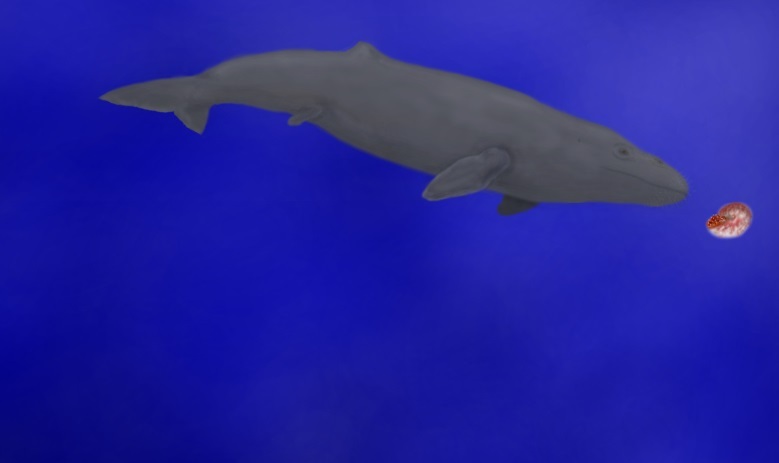 Priabonian Basilosaurus isis (Cetacea) from the Wadi Esh-Shallala formation: First Marine Mammal from the Eocene of Jordan. 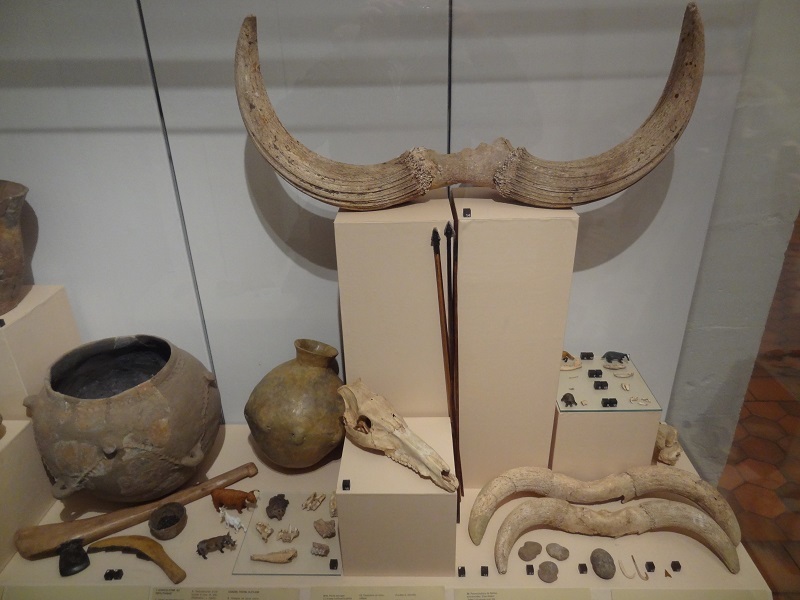 Journal of Vertebrate Paleontology 20(1):201–204. 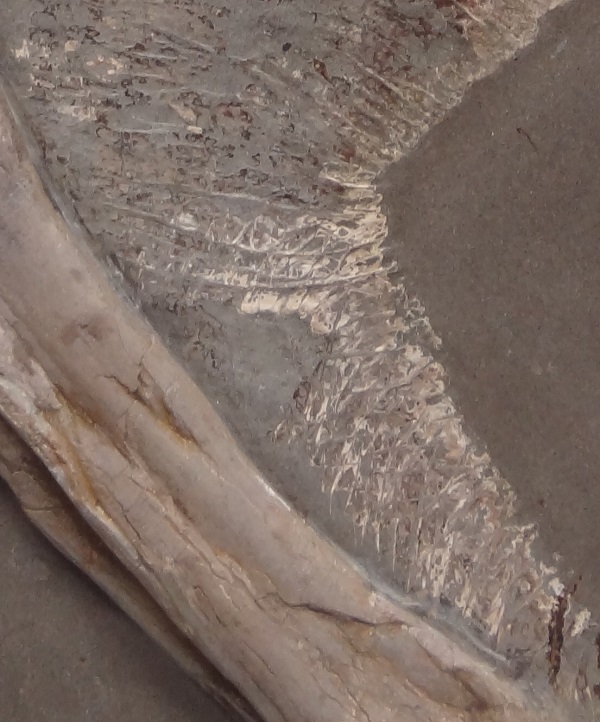 It is well known that there are a lot of wonderfully preserved ichthyosaur fossils with skin impressions, especially from the famous Posidonia shale of Holzmaden. 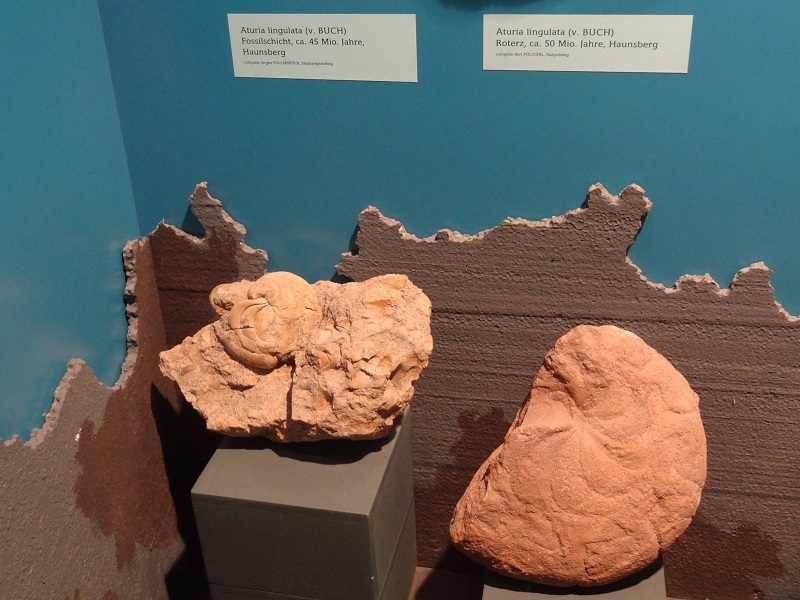 But it is much lesser known that there are also some soft tissue impressions of other marine reptiles as well, for example of some plesiosaur specimens. Admittedly, so far none of them is as well-preserved as the best ichthyosaurs fossils. But today I don´t want to show you ichthyosaurs or plesiosaurs but a truely spectacular fossil from the Posidonia shale of Frittlingen. 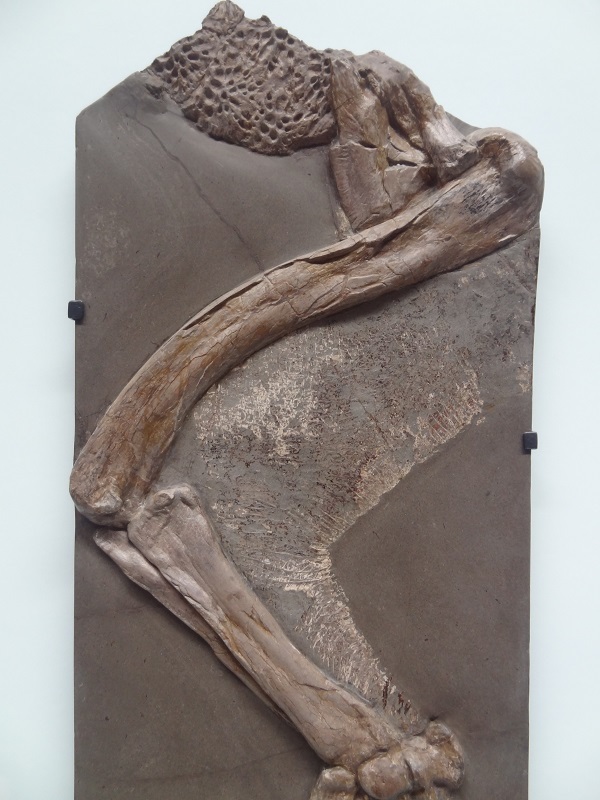 It is a remarkably well preserved leg of a Steneosaurus bollensis, a medium sized marine crocodile which is next to the ichthyosaurs among the most common marine reptiles of the Posidonia shale. 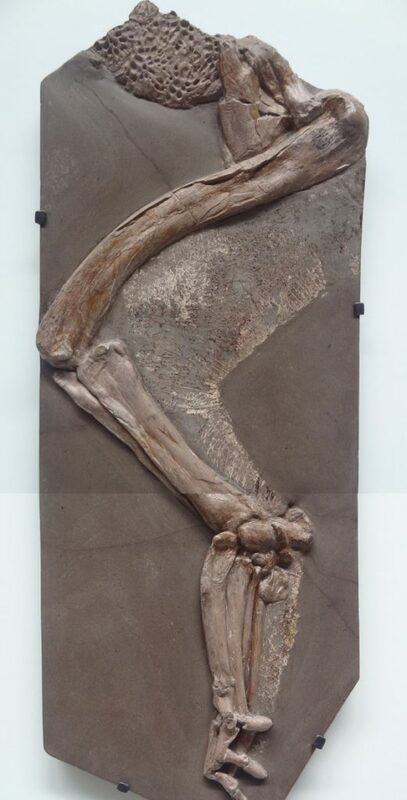 This particular fossil is neither very big nor complete, it´s just a single hindleg, nothing you would normally show in an enormous paleontology museum like the Museum am Löwentor at Stuttgart, which has so many bigger and more complete Steneosaurs in its collection. 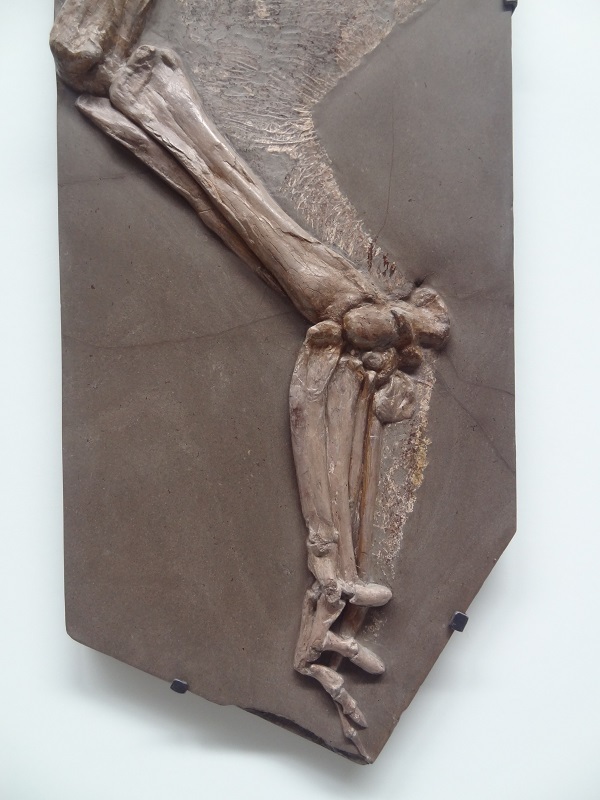 But it´s still really special, as this leg has not only its bones preserved, but also parts of its skin. I had to make a composite of two different photos to show you the whole leg at a better foto quality, as it was hardly possible to take a photo of the whole leg without getting reflections. 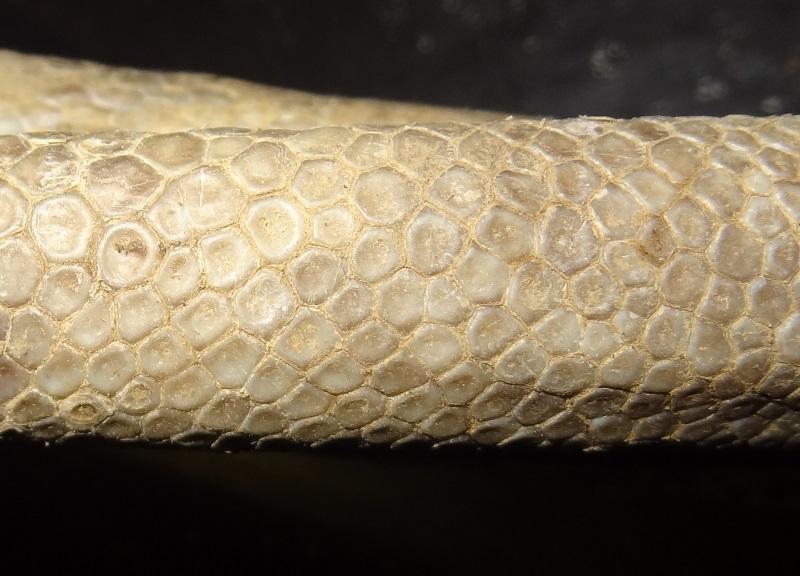 Of course you want to see some more detailed photos of the scales, which are very small and rectangular in shape. 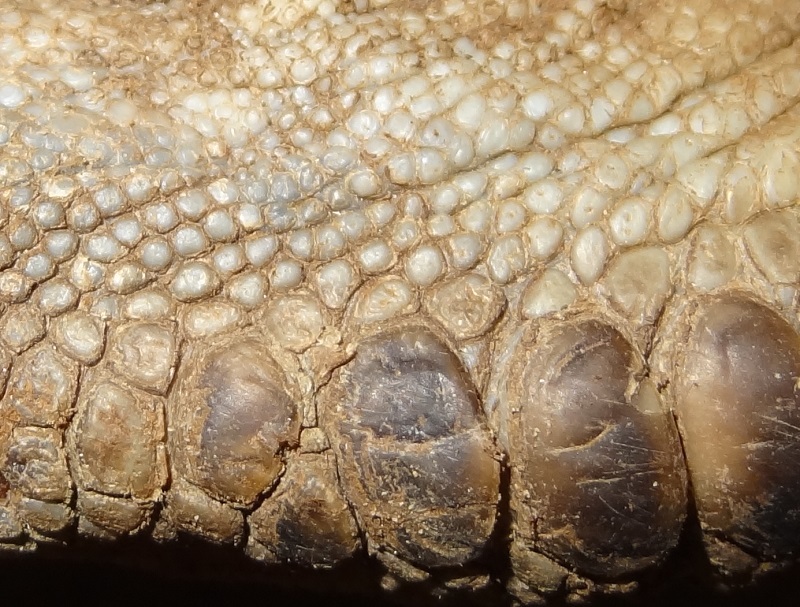 This is likely the inside or underside of the leg, where we find also smaller scutes in modern crocodiles. 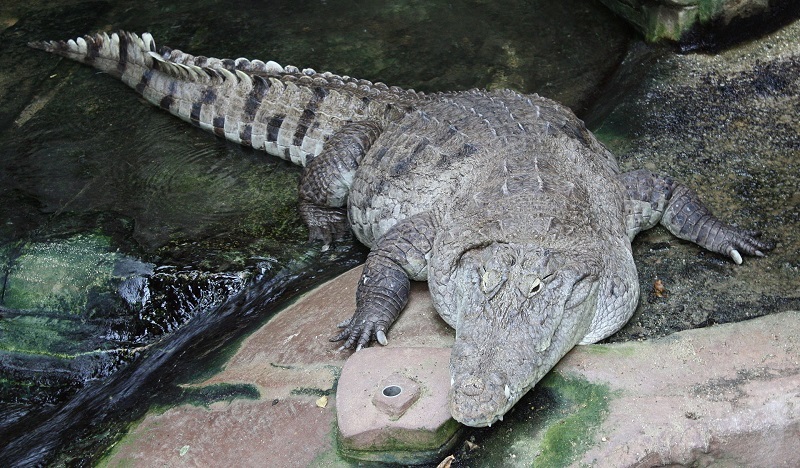 This is really quite interesting as it seems to indicate a trend toward a fine, more flexible and smoother skin in marine crocodylians, which had clearly a very different biology than all crocodylians we see today. 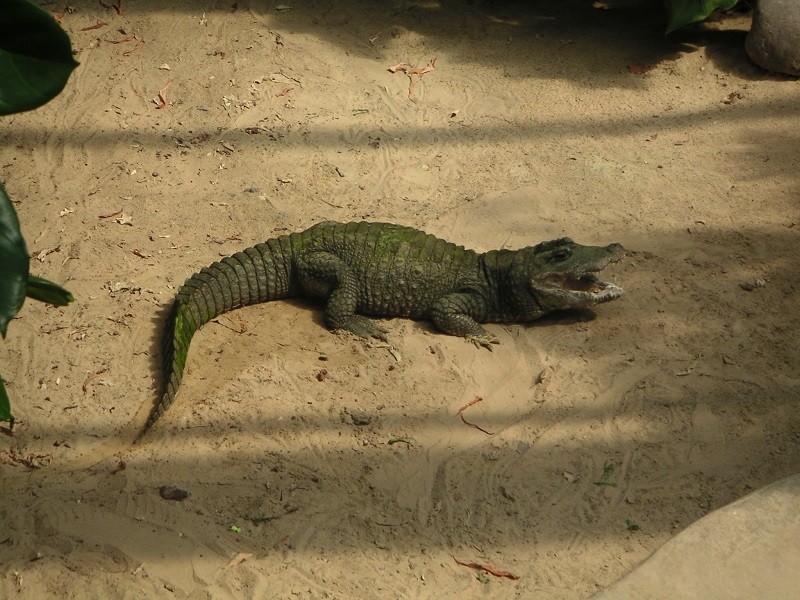 I write „seems to indicate“, because it could be theoretically also possible that the ancestors of Steneosaurus already had finer scutes than extant crocodylians. A simplifaction and smoothing of the skin would be however fully plausible within a lineage which evolved into mainly aquatic and quite likely much more agile marine predators. 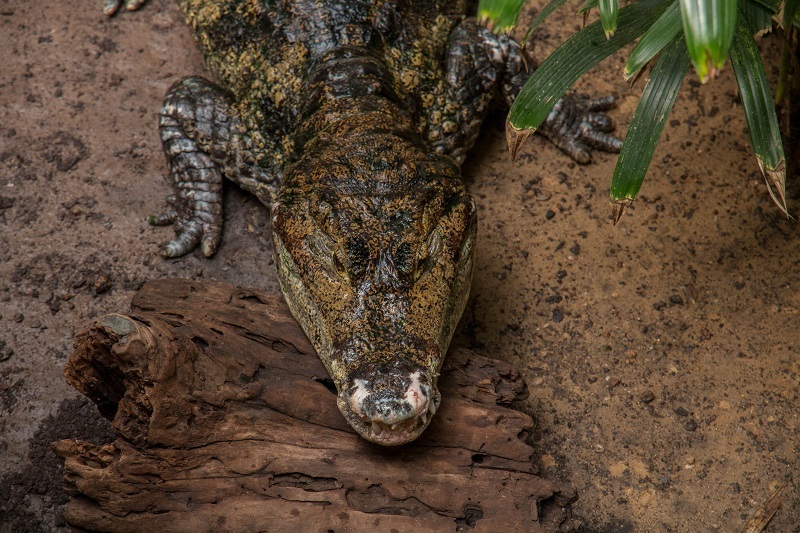 I find it quite interesting that among all modern crocodylians we also find the smoothest and least gnarly skin in the most aquatic form, the bizarre gharial (Gavialis gangeticus). 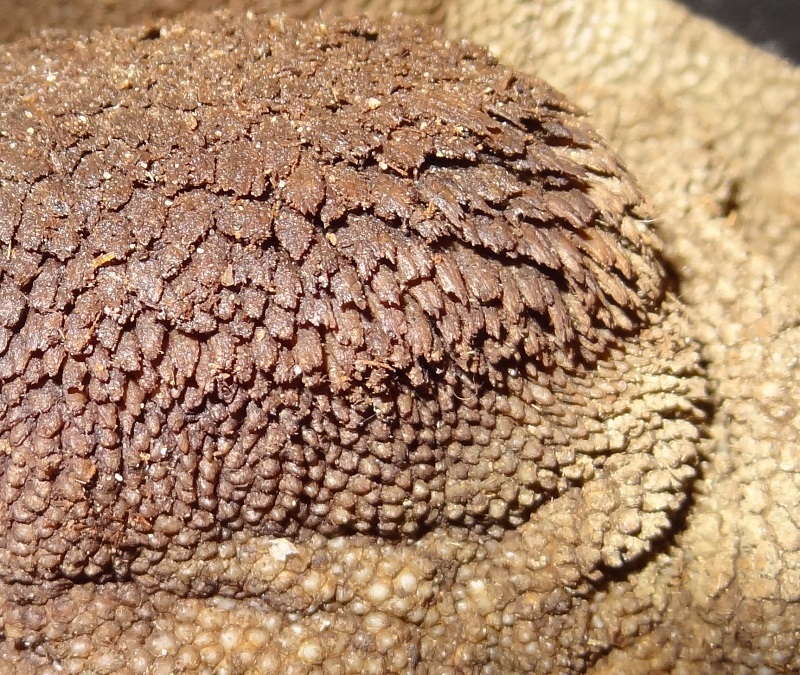 Even its dorsal osteoderms are much lesser pronounced than in crocodiles or alligators. 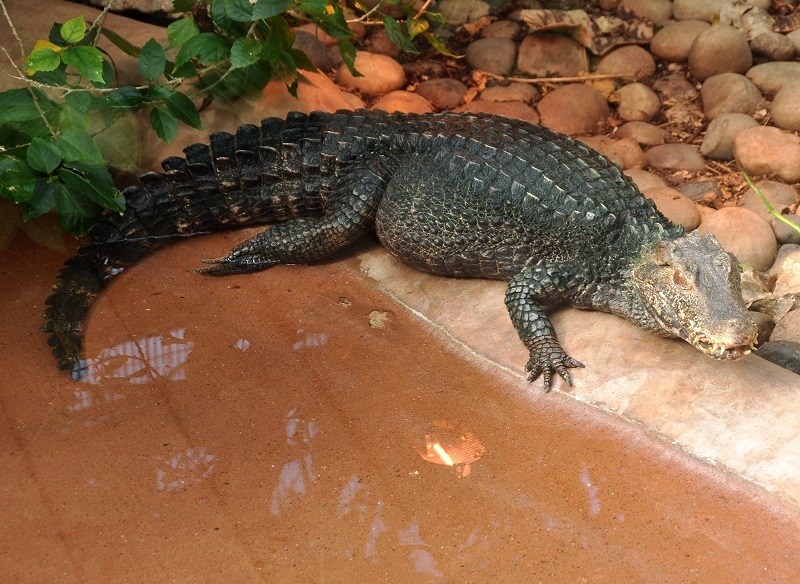 Even their limbs look much more reduced and paddle-like than those of other modern crocodylians. 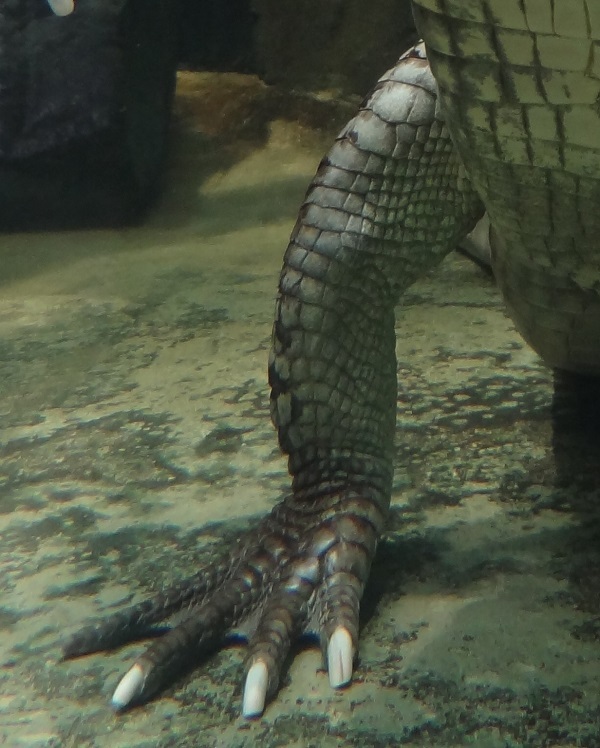 Gharial forelimbs. Not the smooth surface and the stumpy fingers. 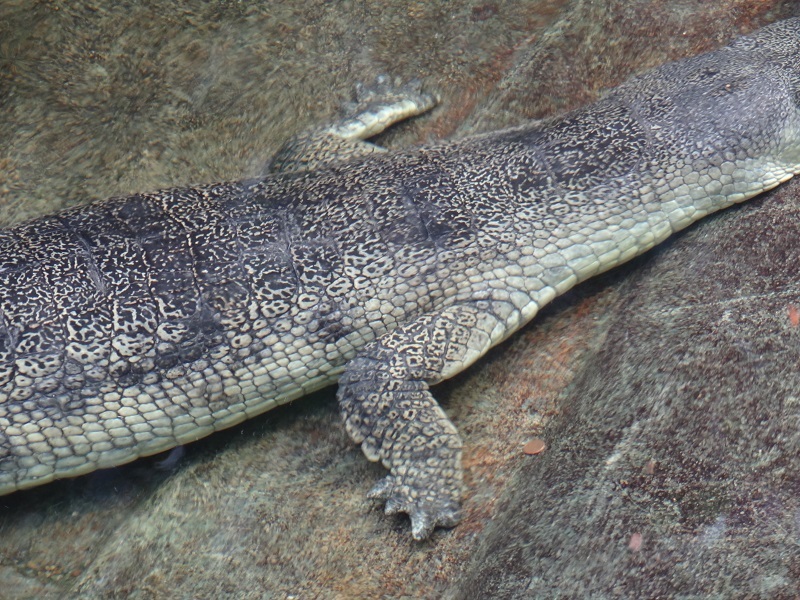 We also find a strong reduction of scales in highly aquatic turtles like pig-nosed turtles, softshell turtles and the leatherback turtle, and we also know that mosasaurs had only tiny scales, and ichthyosaurs even no more scales at all. It would be really interesting to know how the skin looked in the most derived marine crocodylians like the metriorhynchidae, that included large macropredatory forms like Dakosaurus maximus. Fossils like this Steneosaurus leg are of course also extremely worthy for paleoartists, as they show us information about anatomical details which we could never know for sure from the bones alone. Let´s hope that more of such superbly preserved fossils will be found in the future. 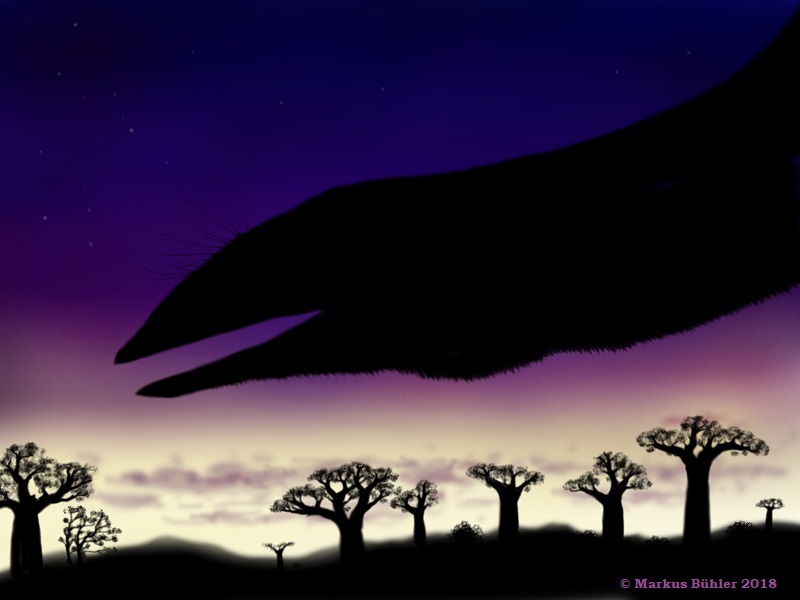 Today I want to feature some paleoart by Dominic Grabowski, which depicts the archaic stem-baleen whale Mammalodon attacking one of those awesome but little-known giant post-creataceous nautilids. I feel really honoured that this was directly inspired by my recent blogpost about post-cretaceous nautilid diversity which I wrote some time ago. This means that my work here can really influence other people´s paleoart and encourage them to deal with certain subjets, and that the countless hours I spent to write my blogposts are appreciated. Thanks Dominic! 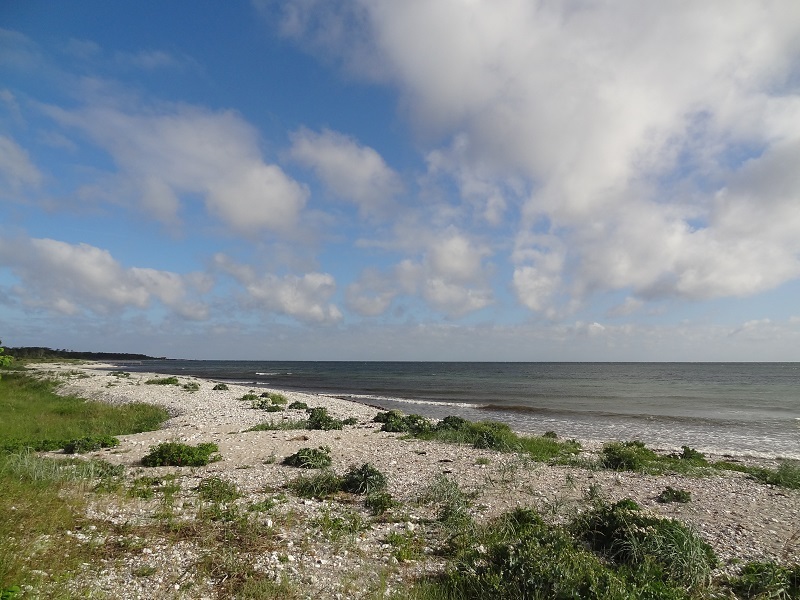 In terms of zoological diversity, the Baltic Sea is probably the most boring sea of the world. It has the lowest salinity of all seas and it is only connected with one other sea, the North Sea. 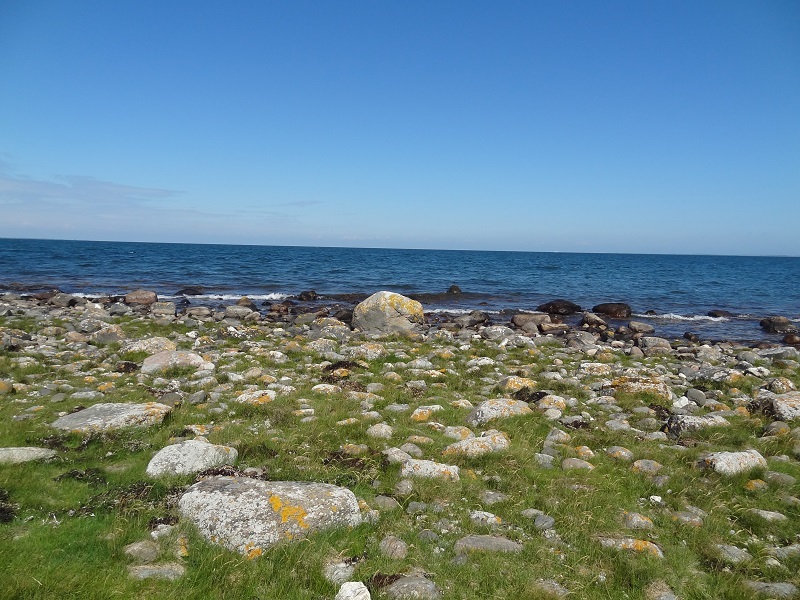 As a result of this it has only a very low number of native species, and those are also not particularly spectacular compared with those of the North Sea or the northern Atlantic. What’s especially noteworthy is the nearly total absence of any bigger animals there. The largest marine mammals which are really native there are grey seals, harbor seals and harbor porpoises. The grey seal and thr harbor seal were already nearly fully extinct in the late 20th century and today there are only a few hundred specimens left. 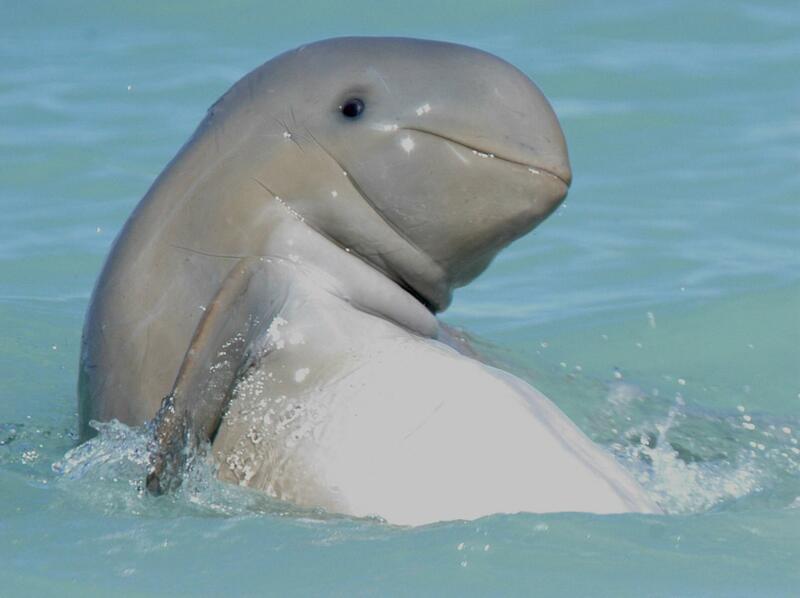 The harbor porpoise is also extremely rare and among the smallest cetaceans of the world. 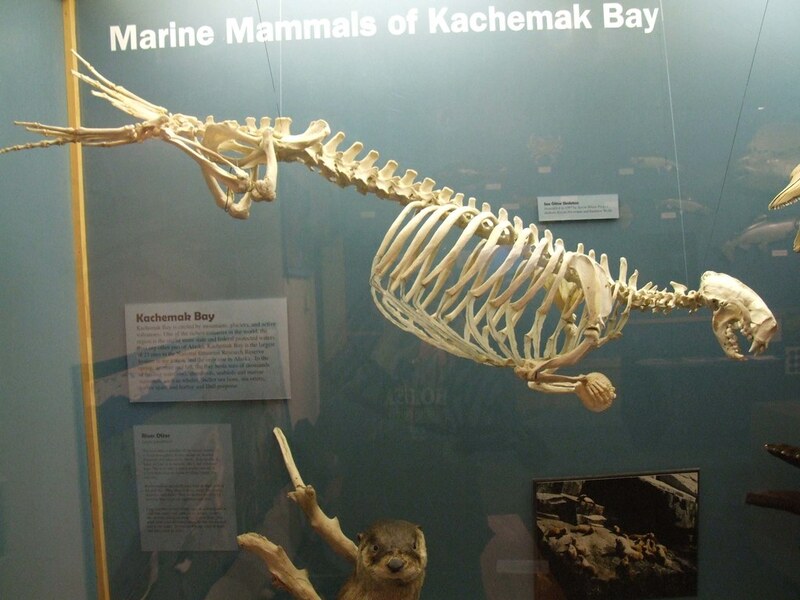 So even the mammalian marine megafauna is not exactly impressive to say it at least. As a result of the low salinity no sharks are native in the waters of the Baltic Sea. 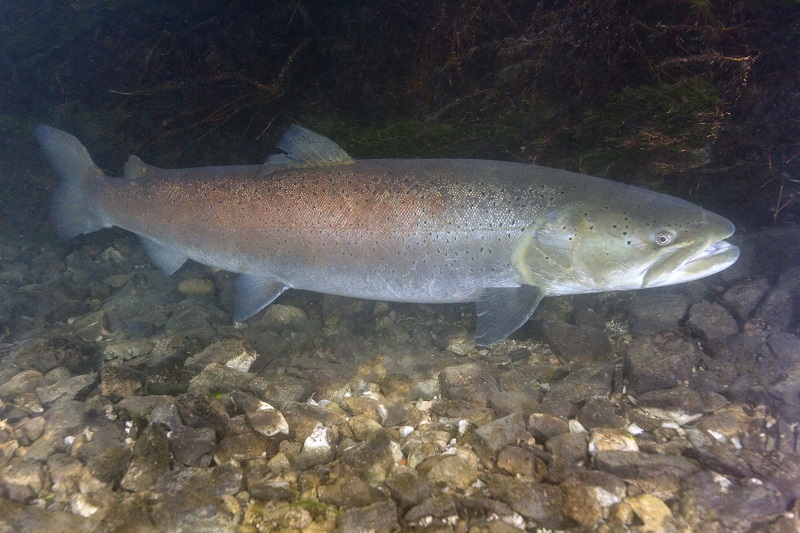 The biggest commonly occuring fish you can hope to see are only Atlantic salmons, sea trouts and cods. 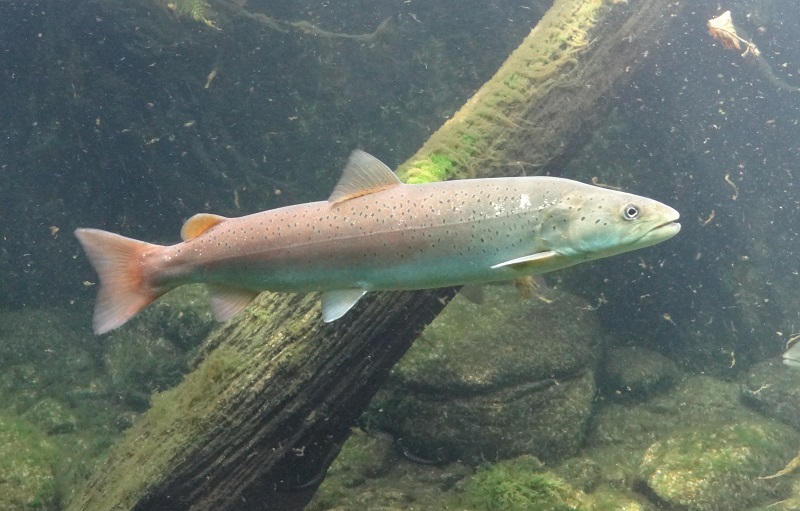 All of them rarely grow bigger than a meter as even the cods of the Baltic Sea stay much smaller than their cousins in the Atlantic Ocean and North Sea. 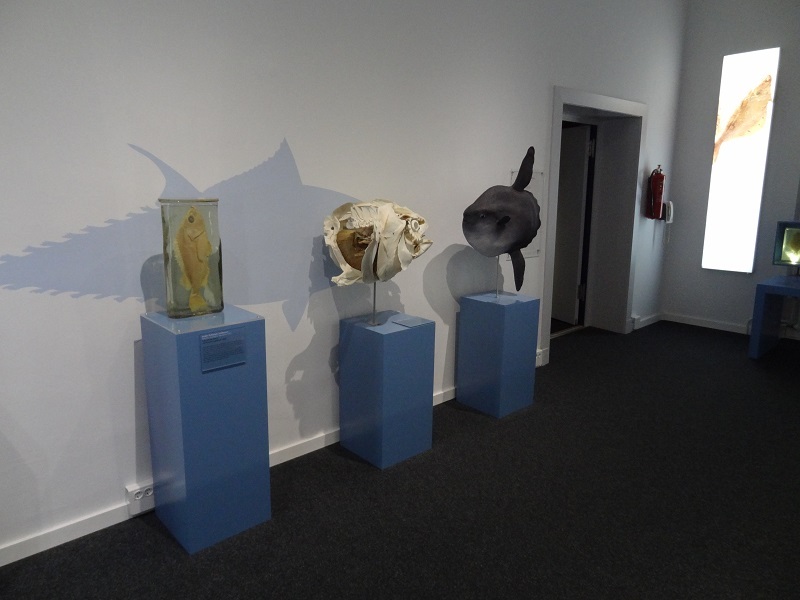 Of course there are occasionally cases of vagrant specimens of bigger fish which usually don’t occur there, or even out-of-place cetaceans like rorquals or sperm whales. But this are rare exceptions and they could not even survive for a long time in the Baltic Sea, as they could not find suitable prey in this shallow sea. As you see, aquatic megafauna is next to absent there. This makes it even more surprising that there actually were gigantic fishes in the Baltic Sea until just a few decades ago. Giant blue fin tunas were common denizens of the Baltic Sea. 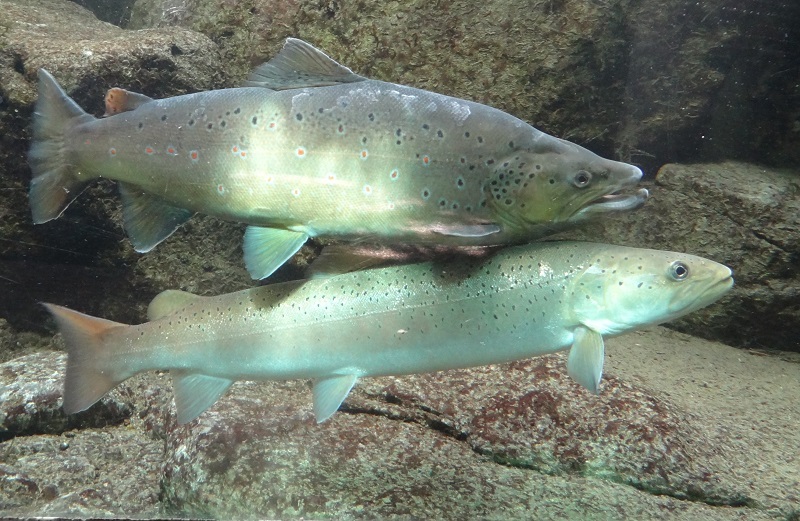 This predators are among the largest teleost fishes of the world, with record specimens of more than 650 kg and lengths of more than 3,5 m. The ones caught in the Baltic Sea were not that gigantic, but still dwarfed every other fish around, since the European sturgeon which also once populated this waters has become practically extinct in the early 20th century. Some of the tunas living off Denmark grew to massive sizes, like this one which was caught around 1880 whose skeleton is now on display at the zoological museum of Copenhagen. Sometimes tunas of more than 300 kg were caught, and the record was even a massive specimen of 372 kg. 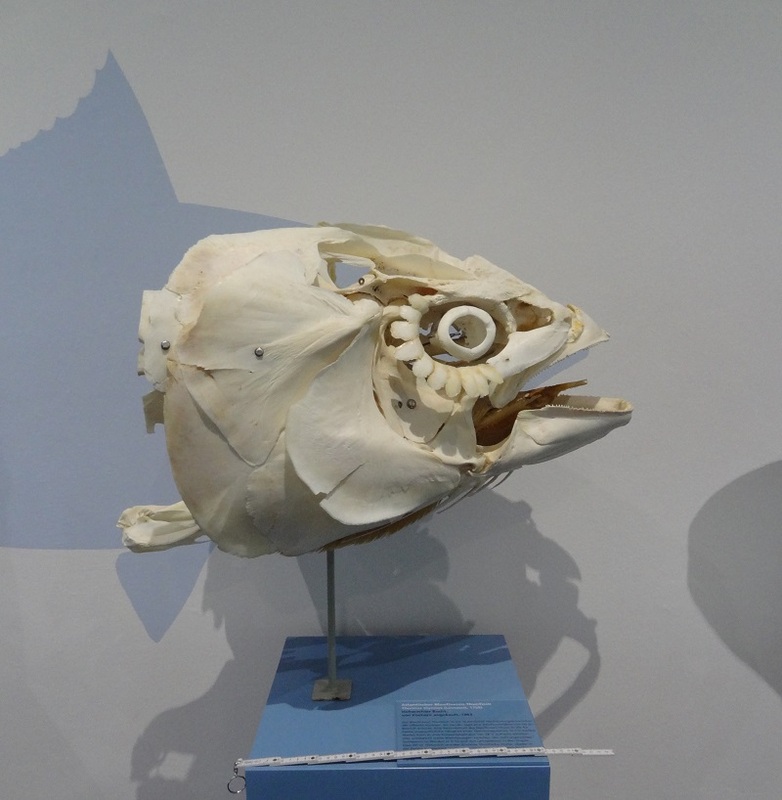 Here is skull of a big tuna caught in 1962 at Howachter Buch, Germany, now on exhibit at the zoological museum of Kiel. I added a pocket rule of 50 cm to give you a better idea of the size. 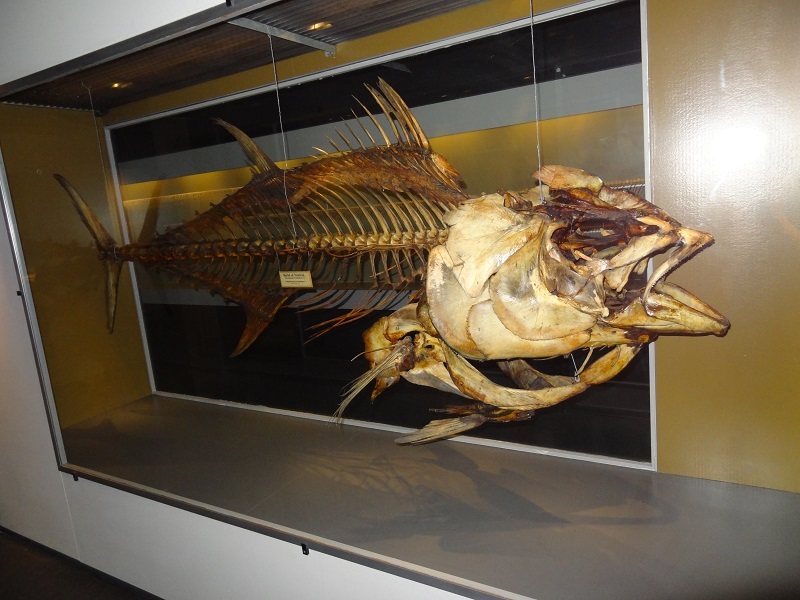 Here is another photo which shows the skull with the reconstructed outline of the whole fish. Bluefin tunas were regularly caught by fishermen in Danish and even German waters. They were so frequently caught that a factory for canned tuna was built in Skagen in 1929. Sport fishermen came even from Great Britain to Denmark for big game fishing. But the whole business ended in the 1960ies when the tunas disappeared from the Baltic sea. The reason was overfishing, not only in Denmark but also in other parts of the world like in the spawning grounds in the Mediterranean Sea and the Atlantic ocean where the bluefin tuna has its nursery ground. Today there is not much that reminds on this giants anymore. 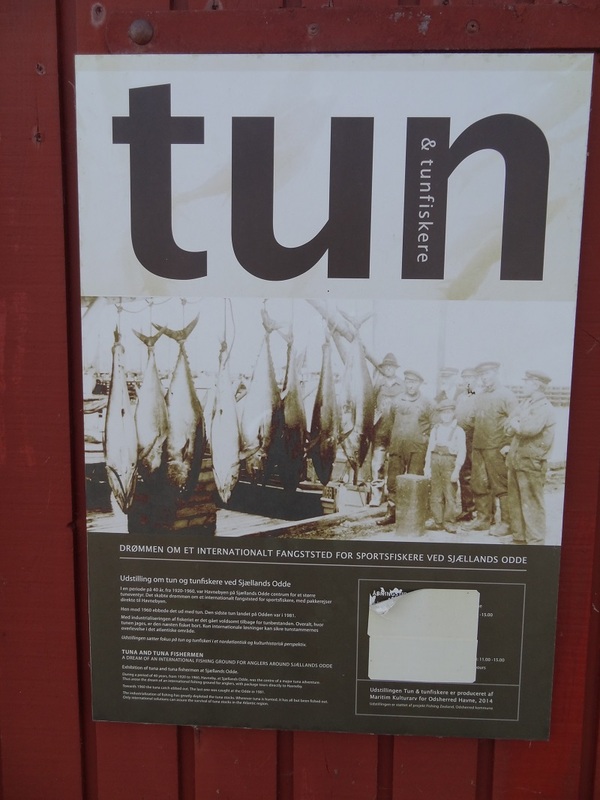 At Odden Havn, a small fishing port at the north coast of Sjaelland, you can still find old photos from the time of commercial tuna fishing, which seem nearly surreal today. Here is a historic photo of fishermen with tunas from Odden Havn, Denmark. This port was one of the former centers of tuna angling and fishing. Even today there is still a tavern name tuna. 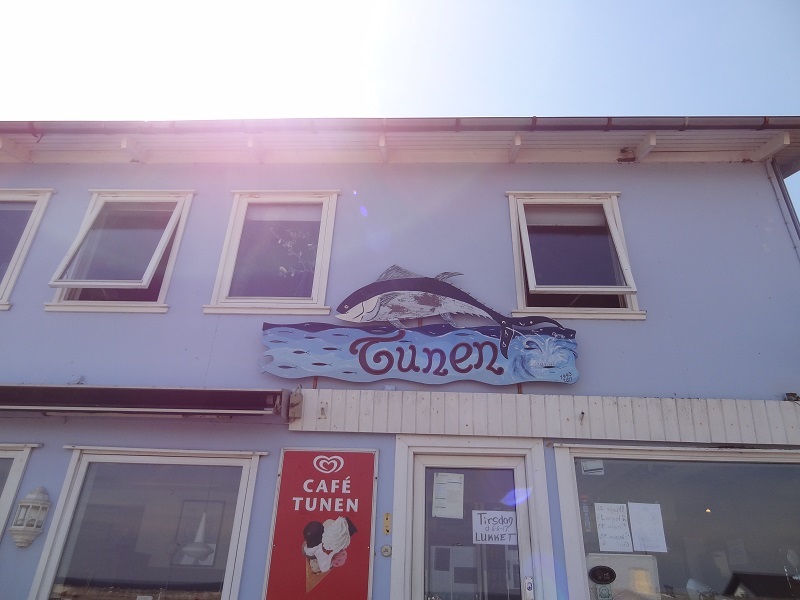 Many years ago, there was still a large taxidermy head and caudal fin of a trophy tuna at the „Tunen“-restaurant of Odden Havn. I think it is now on exhibit at the tuna fishing museum of Odden Havn, which opened just a few years ago. Sadly it was every time closed when I was there, even at days when it should have been open, so I don’t have any photos from the interior. 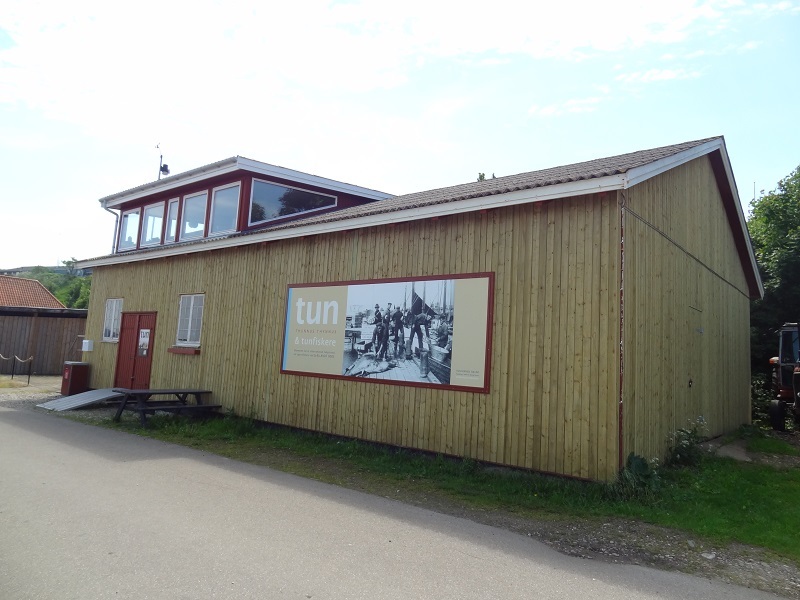 The tuna museum at Odden Havn, Sjaeland. 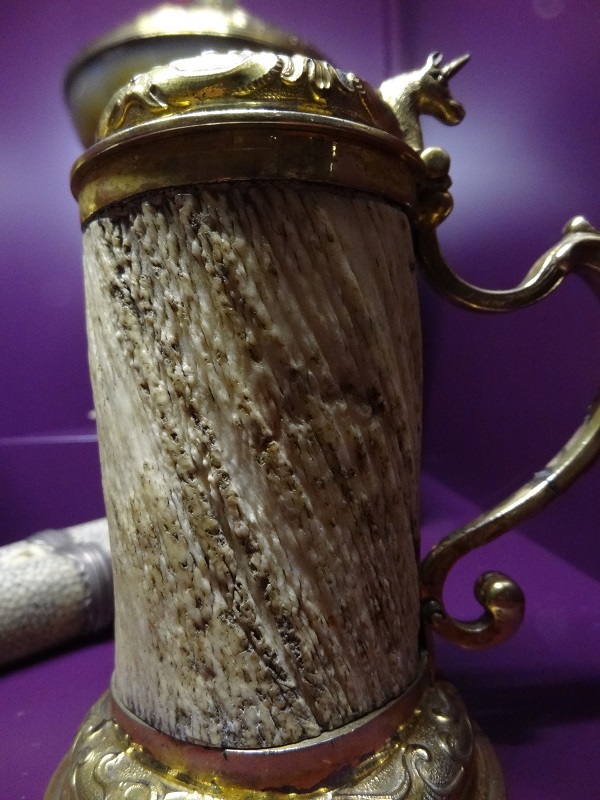 The old trophies, skeletal remains and black and white photos seems to be the last remnants of a bygone era. But in recent years, the first blue fin tunas came back to the Baltic Sea. In September 2017 a swarm of tunas wad sighted off and subsequently a project was started to tag some of them. 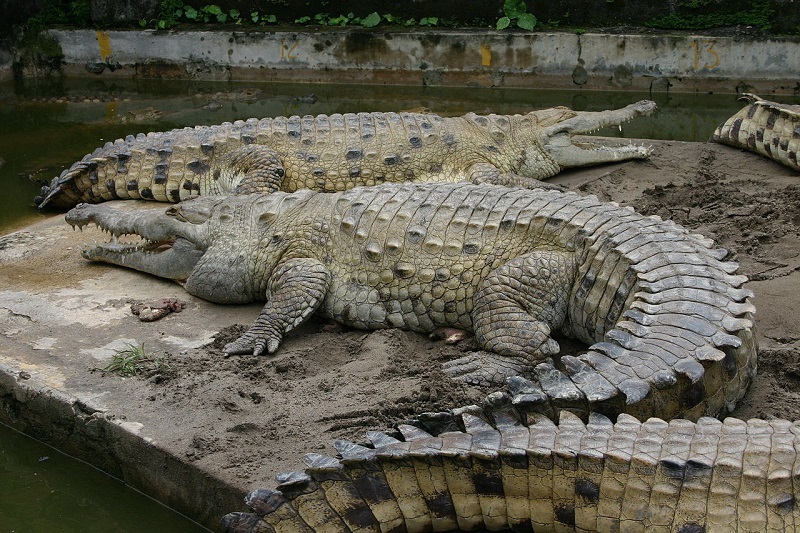 One of them was caught with hook and line, a huge specimen of 2,51 m length and an estimated weight of 285 kg. This was the largest fish which had been caught in this waters since half a century. After it was tagged, it was released again. Of course the tunas are now strictly prohibited there and catching them is only allowed for scientific research. The „Tunen“ restaurant at Odden Havn. It will likely take many decades until tunas are again regularly found in the Baltic Sea, but their eventual reappearance seems to be a good start at least. But it is also a reminder that tunas are not just big tasty fish but endangered marine wildlife which are already exterminated in much if their original range. They are marine megafauna like cetaceans, seals or sharks, but they still don’t get the same sympathies. Even people who are outraged about the slaughter of whales for „scientific research“ or the killing of sharks for their tasteless fins will often still happily and regularly buy and consume tuna. I strictly reduced my tuna consumption already many years ago and it would really help if more people would appreciate those fish not just for their culinary qualities but see them instead as endangered wildlife and giant marine predators which are close to the top of the food chain. 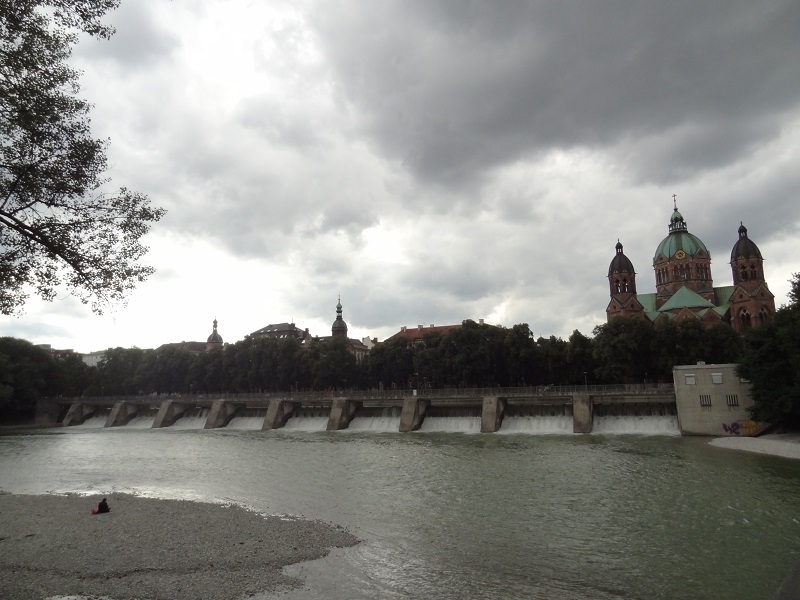 To conclude, I really have to apologize for my seemingly harsh words towards the Baltic Sea at the beginning of the blog. 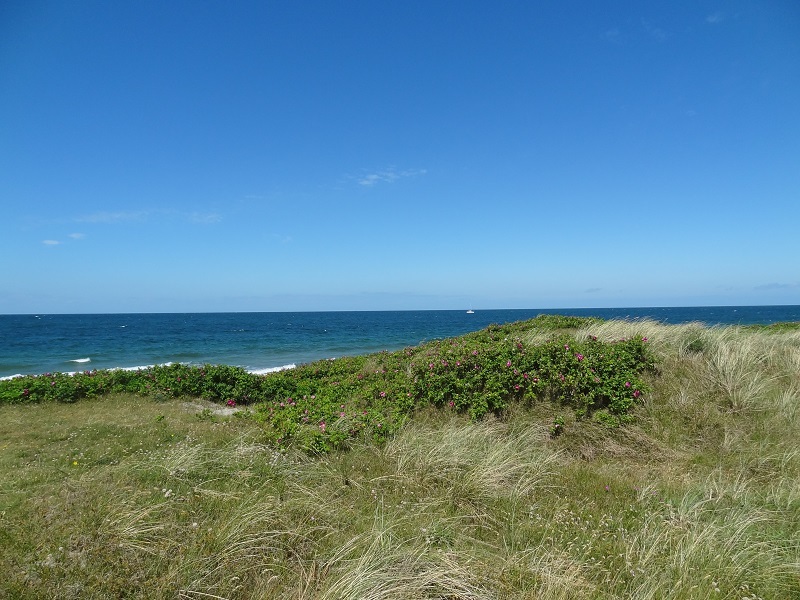 I absolutely love the Baltic Sea, it is by far the sea with which I am most familiar with, and I it has its very own loveliness and beauty. 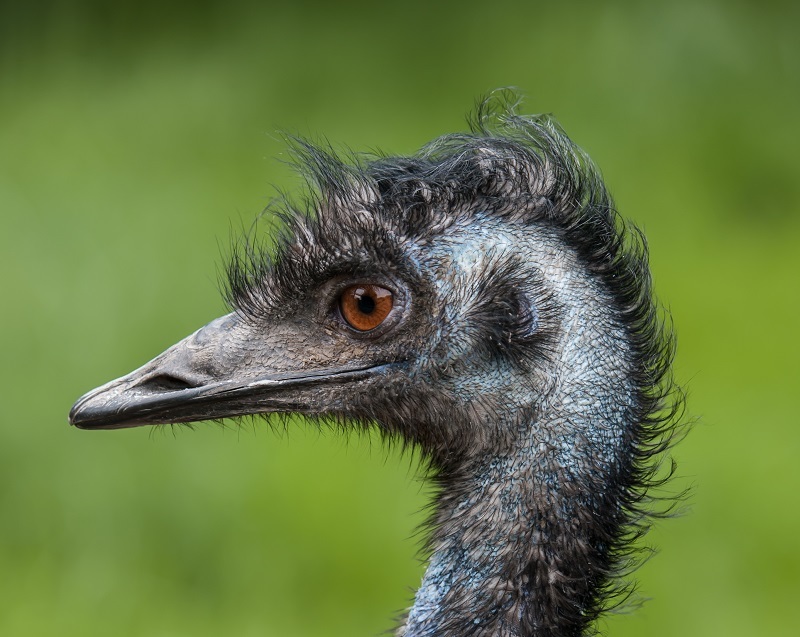 A moustache for the elephant bird – had Aepyornis facial bristles? A recent study in which digital endocasts of elephant bird skulls from Madagascar were examined, has shown that those gigantic flightless birds had extremely reduced optical lobes. At the same time, their olfactory lobes were very large, what indicates that Aepyornithids were likely noctural and used their keen sense of smell to find their food. This reminds a lot on another kind of weird flightless birds of our modern time, the kiwis from New Zealand. Kiwis have very poor eyesight and find their food items – which are mainly earthworms, insect larvea and other inverbetrates – by probing the ground with their highly tactile beaks. One novel trait of kiwis are their nostrils, which are extremely close to the tip of the bill, what allows them to literally smell underground. 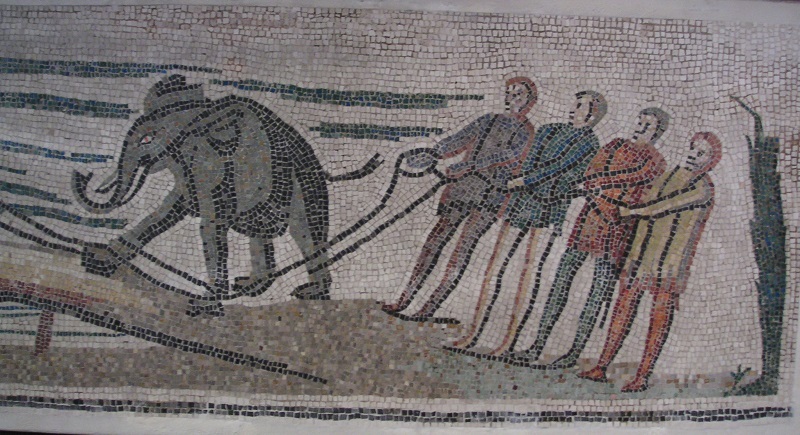 The foraging habits of elephant birds were surely quite different, as they were mainly herbivorous. This whole study is really fascinating, and I recommand you to read it yourself, as I don´t even want to go too much into its details. 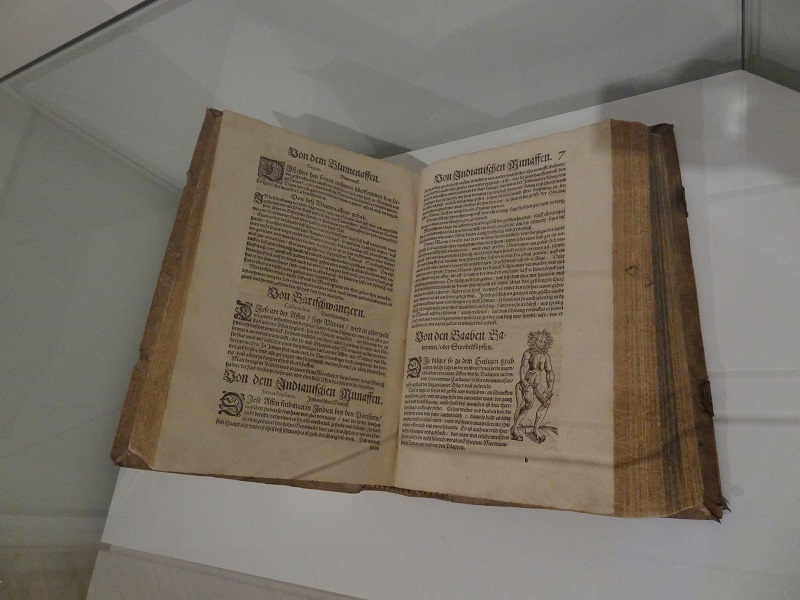 The motivation why I write this blogpost has another reason. If elephant birds like the studied species of Aepyornis maximus and Aepyornis hildebrandti had very poor eyesight and were possibly noctural, is it really that likely that they just relied on their sense of smell in the darkness? I don´t really think so, nor do I really believe that they were blind as many recent headlines boldly claim. Reduced optical lobes do not mean that an animal is fully blind, nor would it make really sense. Even animals which mainly rely on other senses like smell or echolocation, for example shrews or bats, can still see, even if this is not their main sense. Kiwis have also a reduced optical sense, yet they aren´t blind at all. A strong sense of smell alone also does not help a lot for orientation in a forest or scrubland, especially if you´re a giant bird of 3 m height. The orbits of elephant birds also do not indicate a reduction of eyeball size as seen in kiwis, so the claim that those birds were really blind seems quite dubious to say it at least. 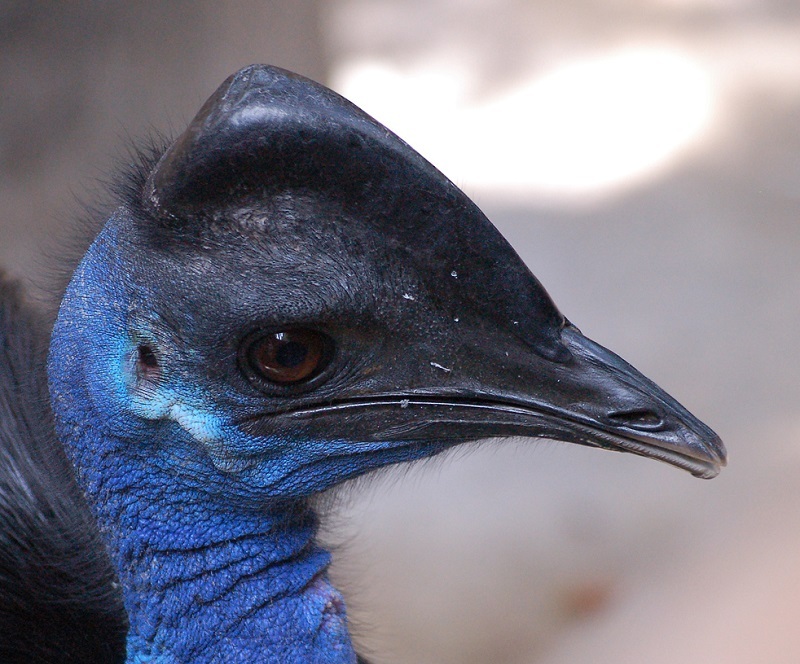 Cassowaries have also a keen sense of smell and are mainly noctural, but show no reduction of their vision. But even if elephant birds really had an extremely strong sense of smell and a really weak (but not absent) vision, is it possible that they used also another sense for orientation or to pick up food items like fruits? 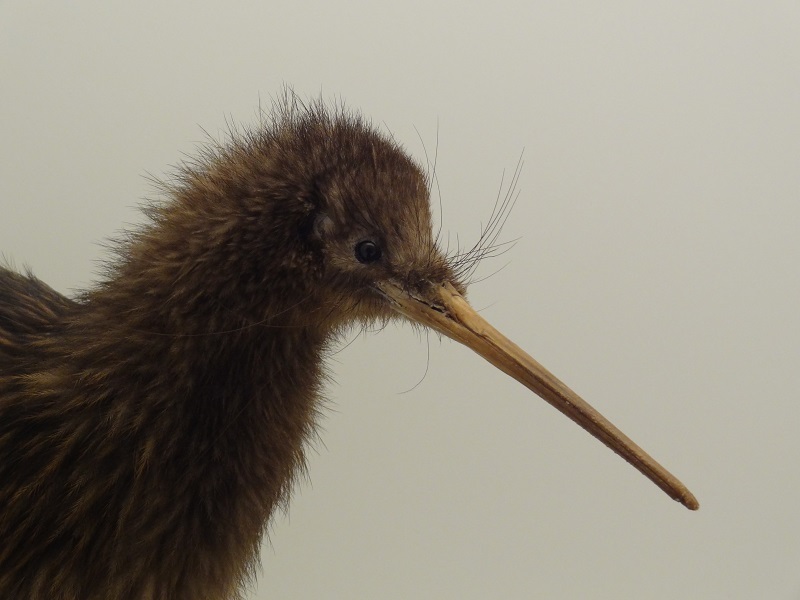 If we look at modern kiwis, we see some extremely long whisker-like feathers near the base of their beaks. They act like the vibrissae of mammals as sensory organs, what´s surely especially important if they have their heads within leaf litter, vegetation of very close to the ground, and to avoid injuries from branches, thorns or stones. So is it possible that elephant birds had similar sensory bristles? If they really had similarly weak vision as kiwis, this seems really quite likely. But I really have to emphasize that this is just speculative so far. A close examination of the invervation of those feathery bristles and their connection with the bigger cranial nerves and corresponding brain areas in kiwis could surely help to see if this structures could have been present in elephant birds as well. I made this illustration of an Aepyornis maximus with some bristles at the base of the upper beak to give you an idea how this could have looked like. 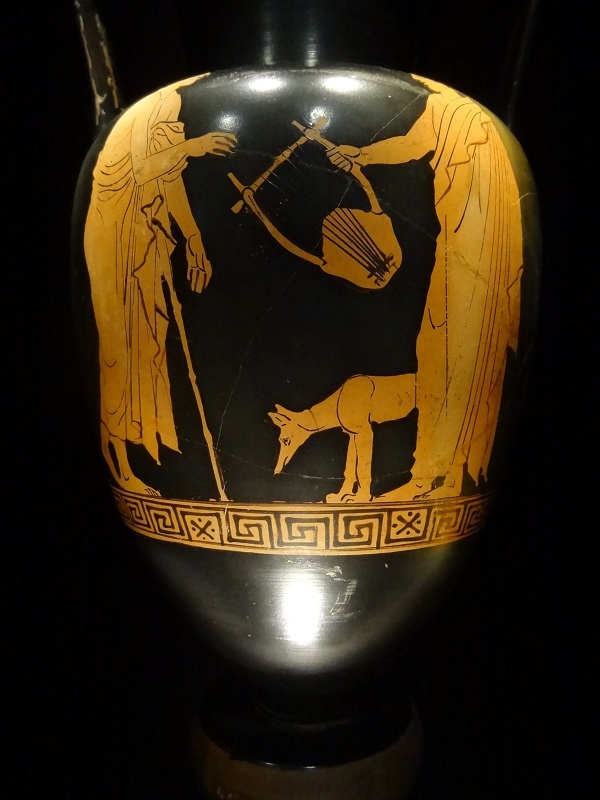 The silhouette depiction made it possible to create this within a comparably short time and to avoid the depiction of the eyes at the same time. Compared with those of kiwis, the bristles are even comparably short and subtly depicted. 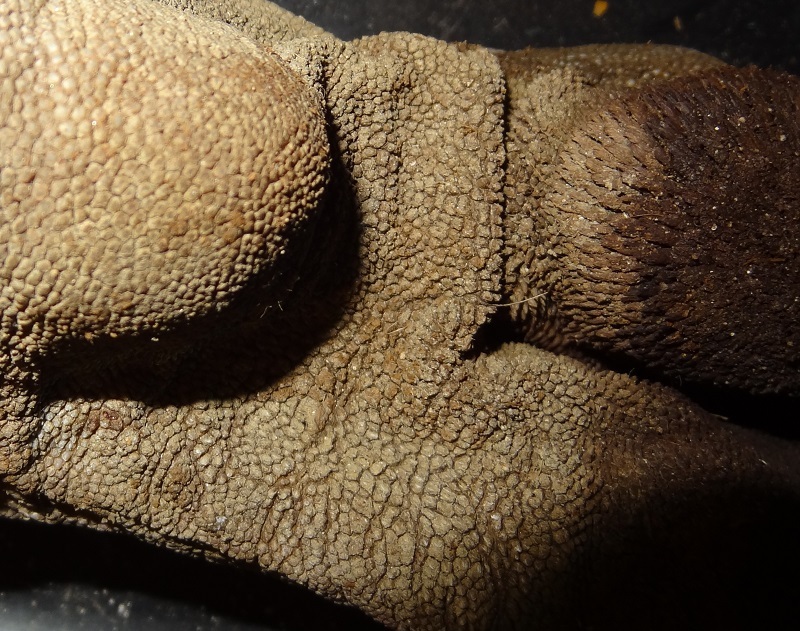 For comparison the head of a taxidermy kiwi specimen which shows the really long and space-consuming bristles which forms some kind of sensory shield around the facial area. If elephant birds really had bristles similar to those on my illustration, or even more extensive as those we find in kiwis, this already highly unusual birds would have been even much more bizarre than we already thought. This makes it even more tragical that we missed those enigmatic creatures just for a few centuries, and much of their anatomy and biology will still remain a mystery forever. It is also interesting to take a look at some modern large flightless birds. 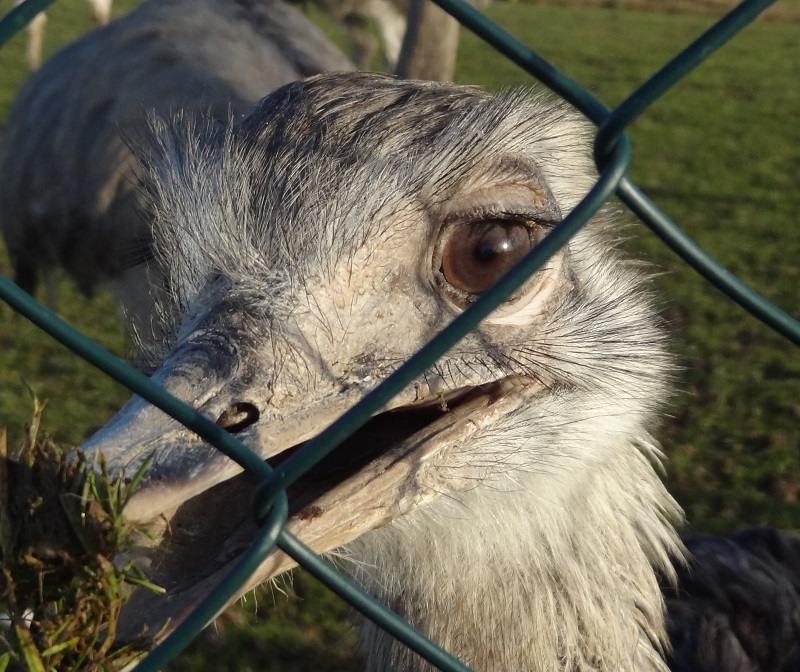 Rheas have also bristle-like feathers around the corners of their mouths, the base of the beak and around the eyes. We see a similar condition in emus as well. Even if this could have an additional function to protect the eyes and ear openings from dust and dirt, it seems also likely that they could have a sensory function to avoid injuries of the facial area when they pick for food. 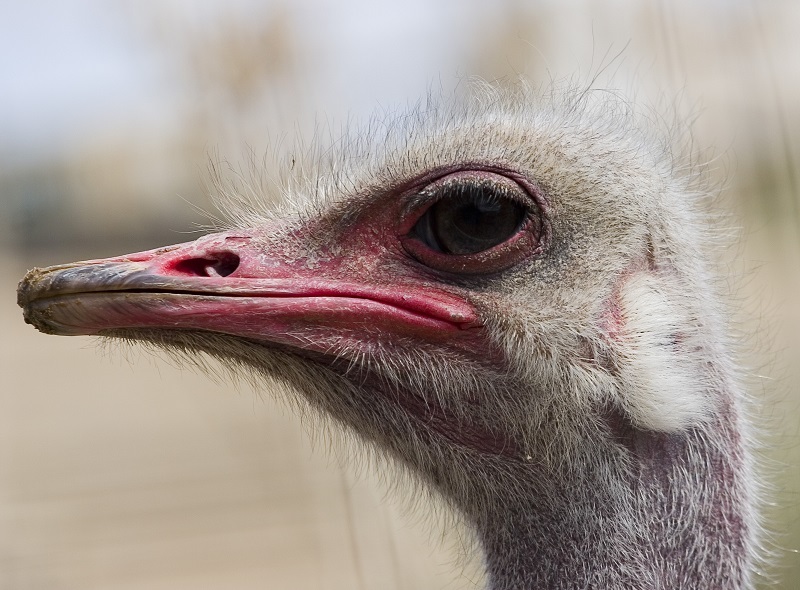 Ostriches have also very long fine feathers, which were especially well developed at the upper base of their beaks. 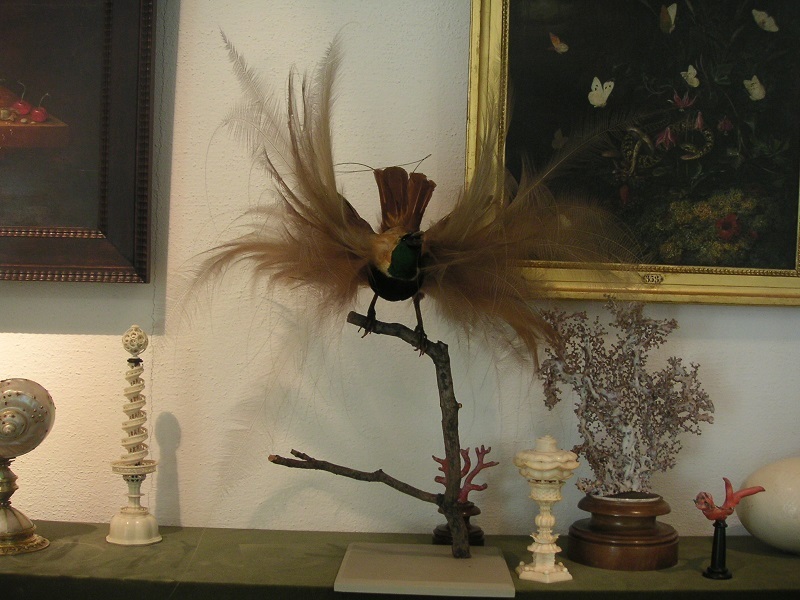 They don´t show the bristle-like nature as those of kiwis, which differ significiantly from the surrounding plumage. Now the weird thing is that cassowaries fully lack such bristle-like feathers around their mouth or beaks, and it is hard to say why. It is still really strange, as cassowaries are among all those modern flightless birds here the ones which live in the most densely vegetated habitats. Perhaps their strong ceratinous frontal shields prevents them from most injuries. If you take a close look at this photo, you will also notivce the position of the nostrils, which are pretty close to the tip of the beak. 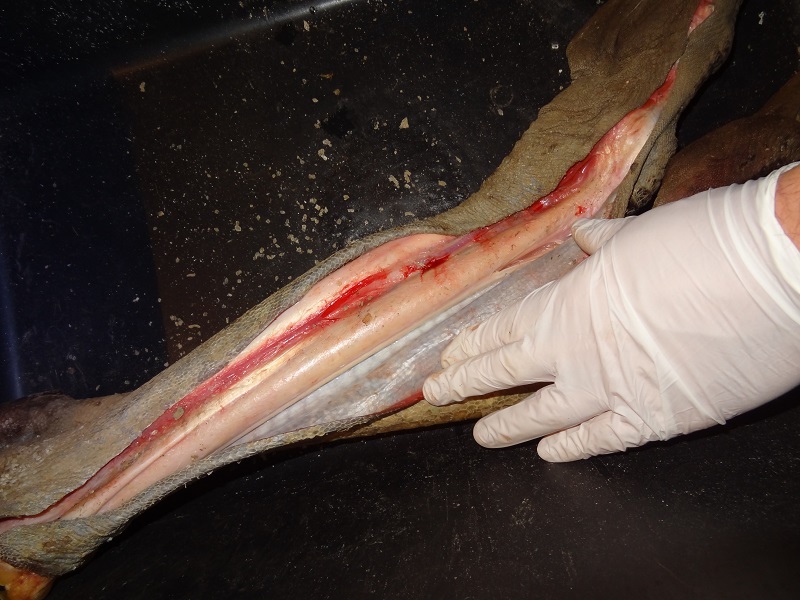 So again we see that soft tissue reconstructions from animals only known from their bones remain a challenge with a lot of unsolved questions. The modern nautilus is usually seen as some sort of archaic relic from an ancient era, unaffected by the changes of time. They are often considered as an anachronistic remnant of an age when the seas were populated by marine saurians and ammonites. But this animals are much more diverse than most people think. 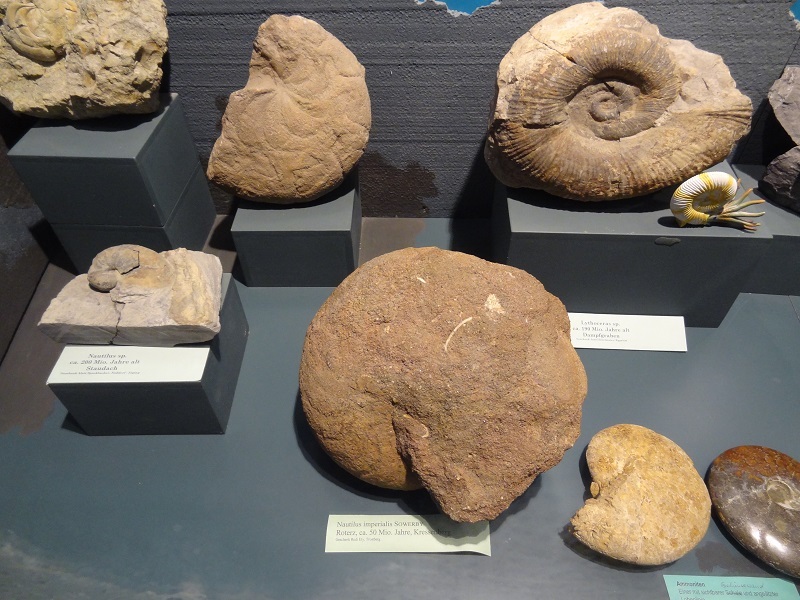 Even long after the extinction of the ammonites, which had been a dominating element of the oceans over hundreds of millions of years, the nautilus family still thrived. There is also not just one modern nautilus species. Besides the well known Nautilus pompilius, there are – depending on morphological or genetic differences – from two to six other species. This includes Allonautilus, a highly elusive cephalopod genus which had been known for a long time solely from floating shells. There are two known species, A. perforatus and A. scrobiculatus. 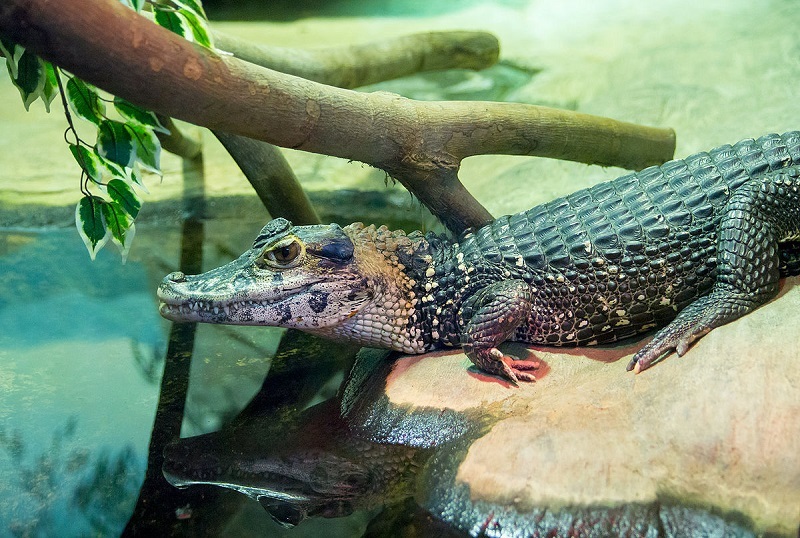 It was already assumed to have gone extinct, until living specimens of A. scrobiculatus were found in 2015. 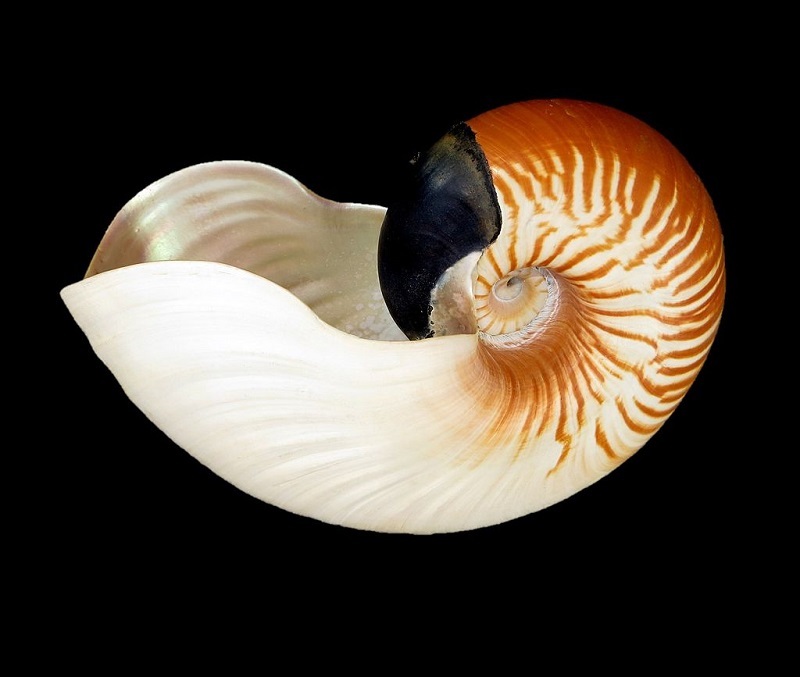 Allonautilus differs significantly in the shape of its shell from Nautilus, but even more so in other traits. The hood or lid on the top of the head which is also used to close the opening of the shell is dark purple in color. It is covered with more and denser tubercles than the lid of Nautilus and is also very different in overall shape. Allonautilus is also called the fuzzy nautilus, because its shell is covered by a yellowish fine fuzz, whose function is still unknown. Interestingly it seems that Nautilus and Allonautilus are paraphyletic and that Allonautilus evolved from Nautilus. This is also important considering the age of Nautilus, which is apparently also not older than around 60 million years. A. perforatus shows also a unique ribbing of the shell, which is not found in any other extant Nautilus species. How the rest of the animal looks in life is still unknown. 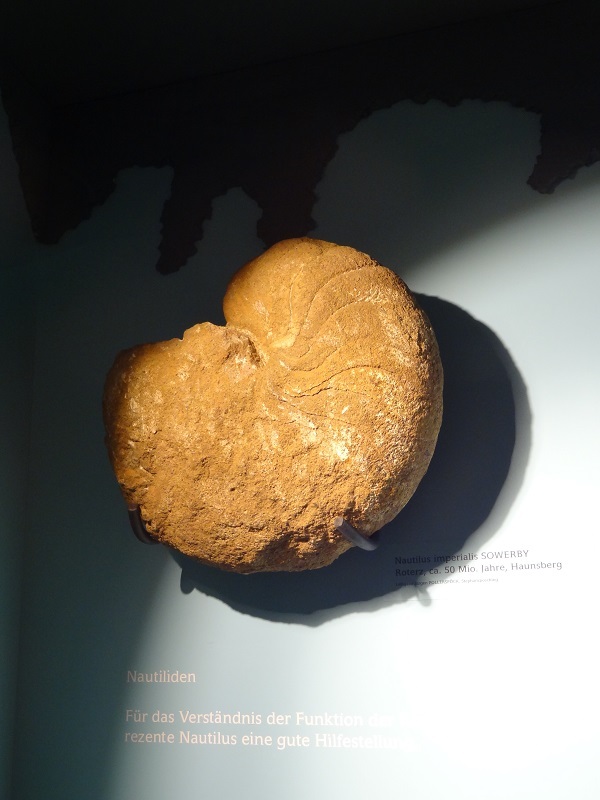 As primordial as they may appear today, the Nautilida kept on evolving within the last 65 million years, and the modern species are no unchanged living fossils, but the products of ongoing evolution. So I made it still not too different from N. pompilius, with a more extensive red area of the shell, lesser distinctive stripes and a different shape of the lid with small but numerous tubercles. To give it a bit more life I tried to add some background scenery, four additional nautilus specimens and an archaic whale. I used two fossils of N. imperialis fossils from the museum at Siegsdorf as references. They are 50 million years old and admittedly I don’t know if the derived fully aquatic archaeocete is not already somewhat anachronistic, as it would be around 10 million years younger. But I could not find more references when N. imperialis or very similar forms became finally extinct. 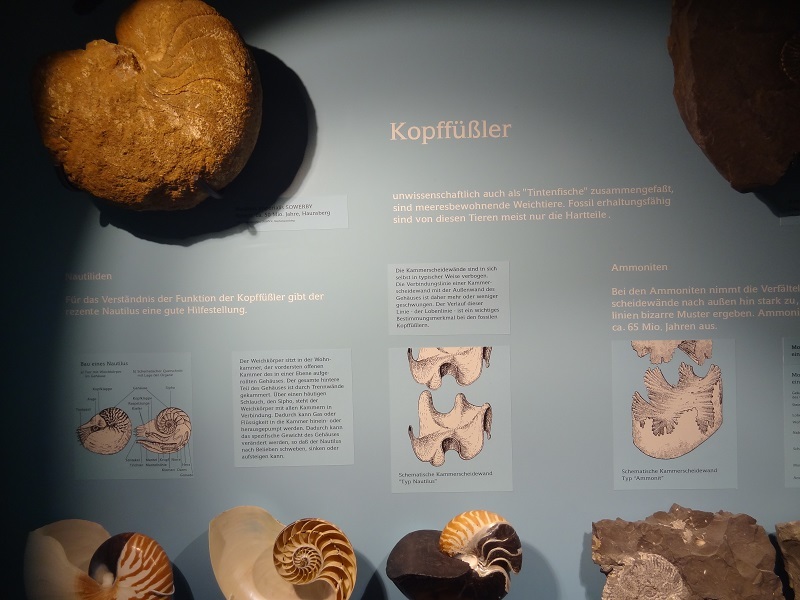 There is even some speculation that the rise of marine archaeocetes was the driving force behind the reduction of nautilus diversity. Many thanks here also to Joschua Knüppe who gave me many highly helpful tips for the use and effects of colors and light underwater and the work with digital graphic programs. At the end this project which was only an intention to make a life reconstruction of N. imperialis for this blogpost at first, turned into something on which I worked several hours a day over a whole week. I am still not happy with a lot of details, but anytime I decided to make a break. 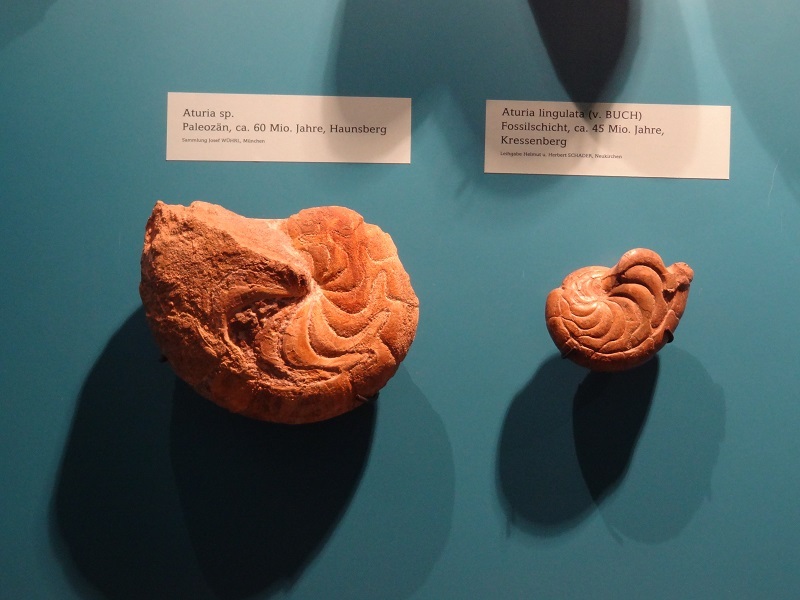 This Arturia shells have highly ornamented shells, very unlike the Nautilus shells we are used to see today. With this blogspot I also hope to evoke some more general interest in the lesser known post cretaceous marine fauna which did not just consist of Megalodon and some archaic whales. This is also meant as a hint to all those readers who create paleoart. If you make life reconstructions of archaic whales or other postcretaceous marine mammals, you can give your art much more life and informative depth by adding not just some random fish or invertebrates, but real contemporary fauna. 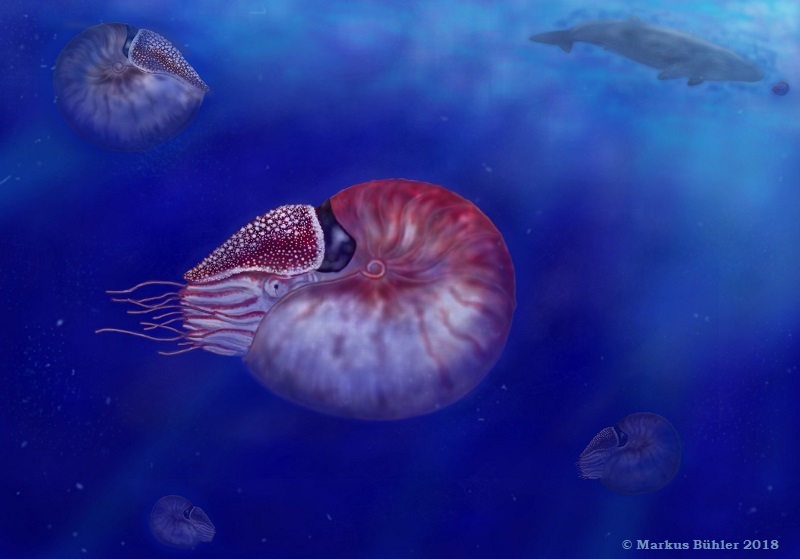 Animals like those big or elaborate nautilus species are practically absent in paleoart. 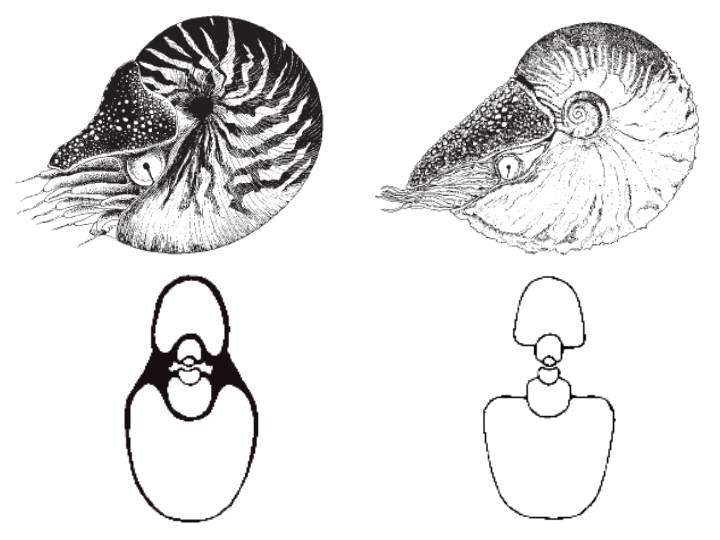 Perhaps this blogpost will inspire some of the many people who are much more skilled artists than myself to draw or paint anytime their own reconstructions of postcretaceous nautiluses, either as a main sujet or accompanying other marine fauna. Random archaeocete with a nautilus from the background of the bigger screen, before it was covered by shadows and light effects. Sadly the vibrissae on its lips are hardly visible here.